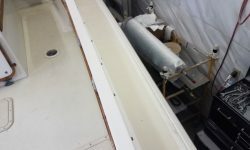 I began the project, as usual, with an overall inspection to determine the scope of work for each segment of the job. 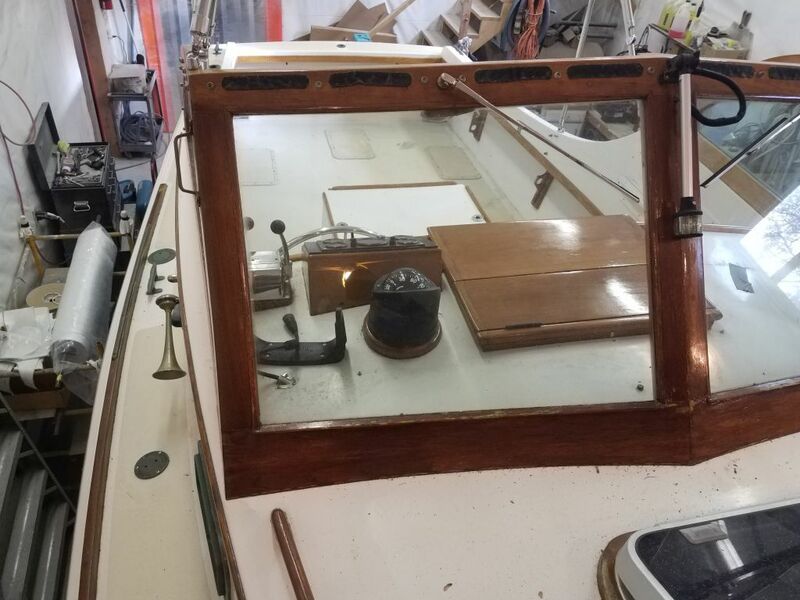 I knew Skeedeen well, as I’d done various work on her over the years, but it had been quite some time since she’d been in the shop here. 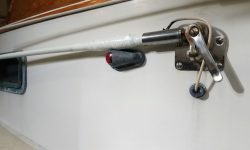 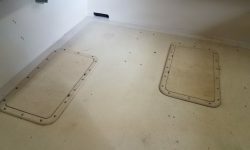 The boat’s apparently original nonskid pattern on the decks was well-worn, and had lost a lot of its nonslip ability as well as its looks. 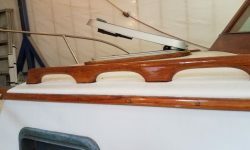 The original material featured a rough-ish, random pattern of peaks and swirls, apparently installed as an applique and not a molded part of the deck. 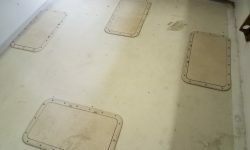 After several past stops and starts about the nonskid project over the years, with the job ending up postponed for one reason or another, the owner and I both looked forward to renewing this surface. 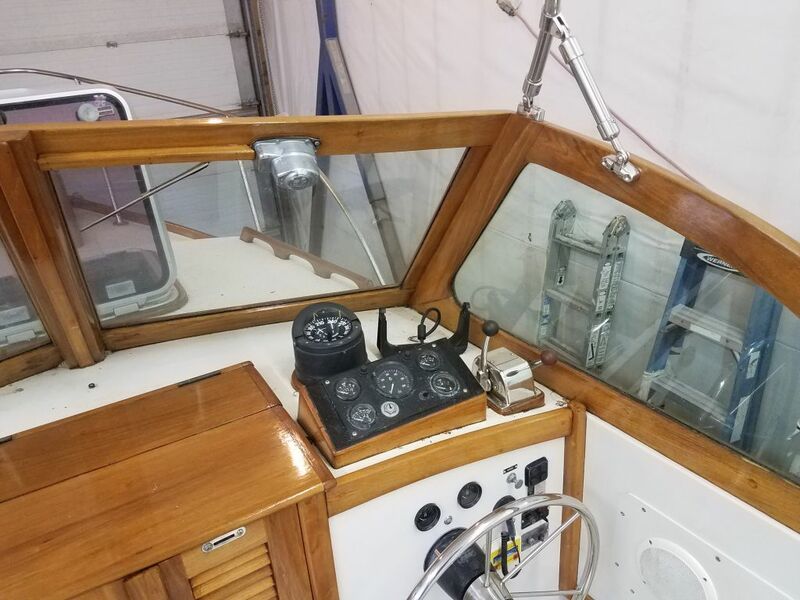 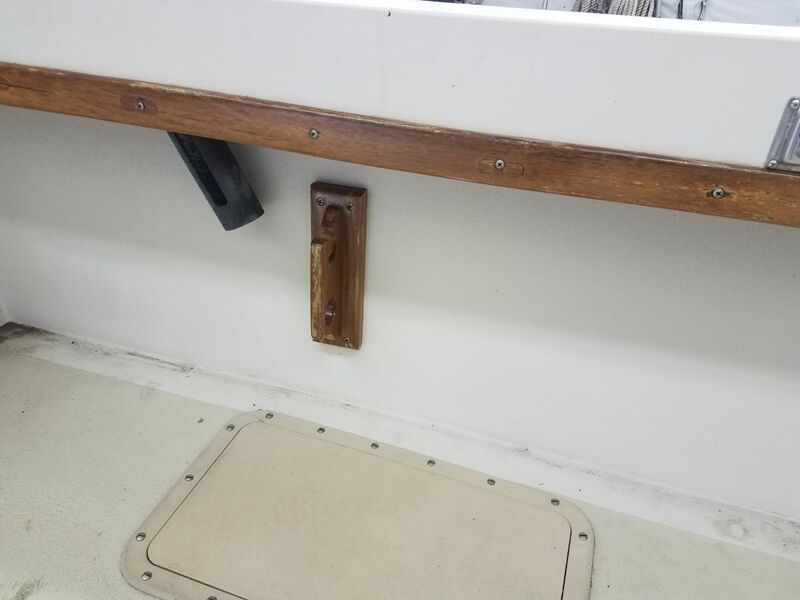 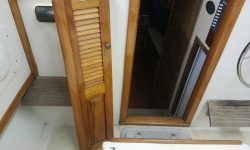 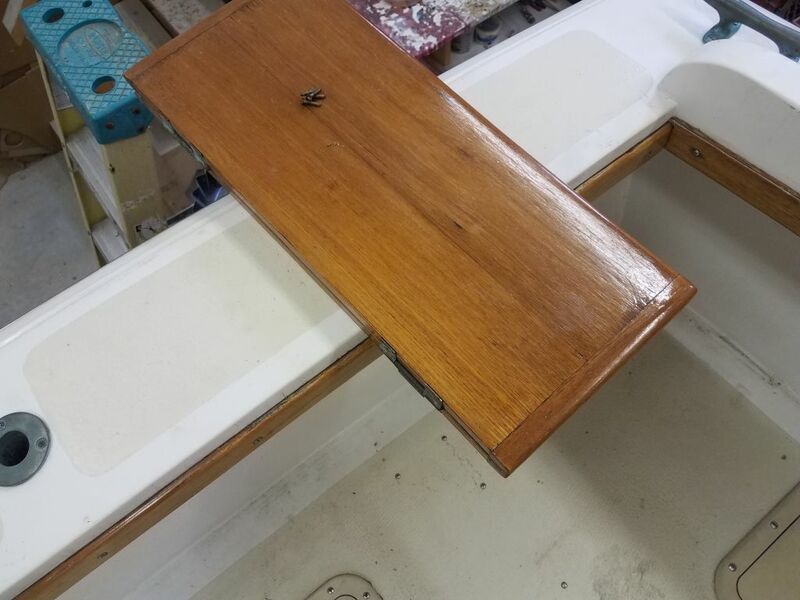 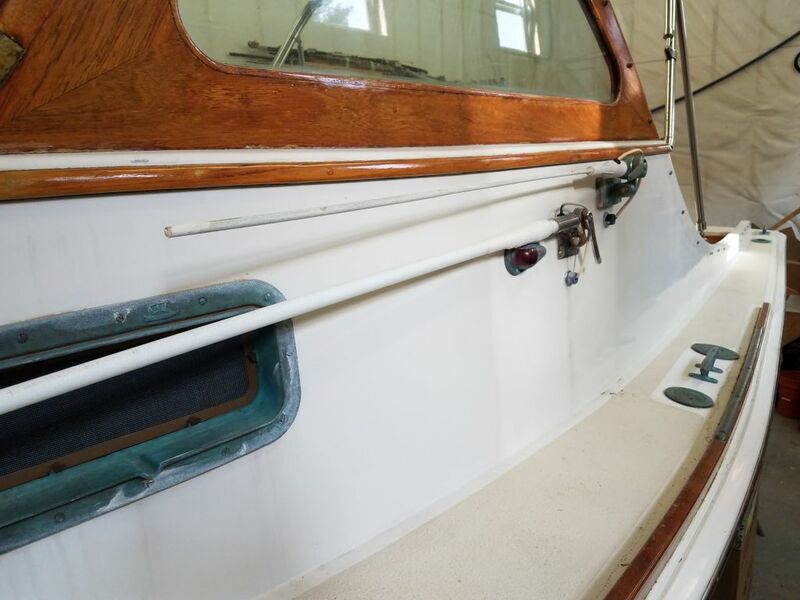 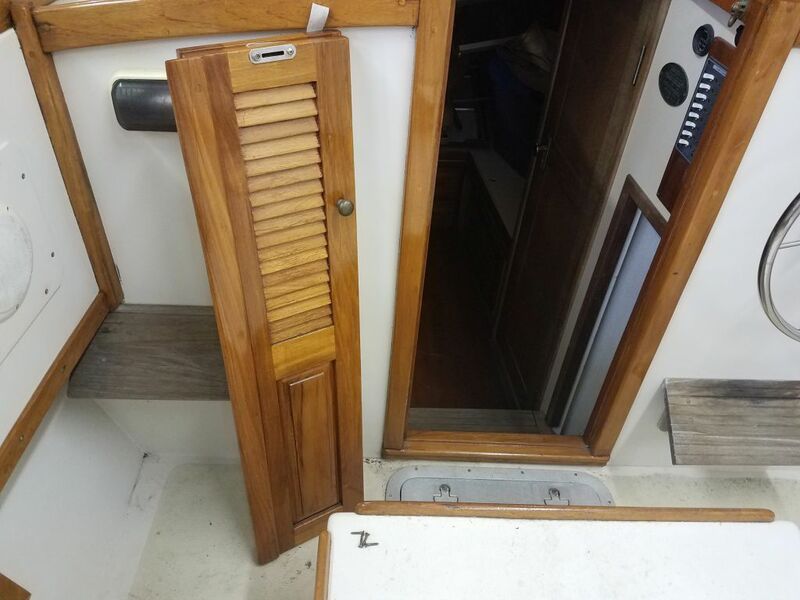 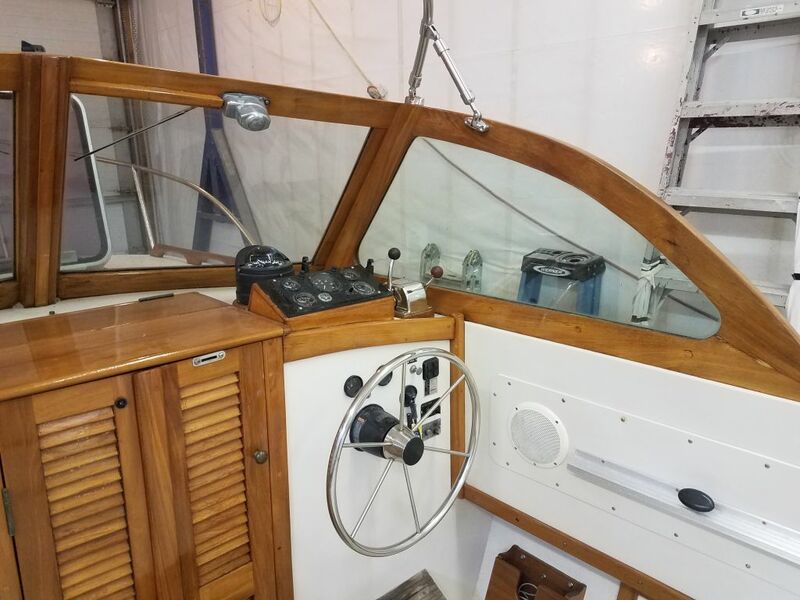 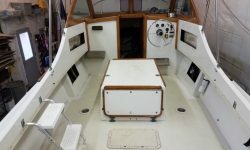 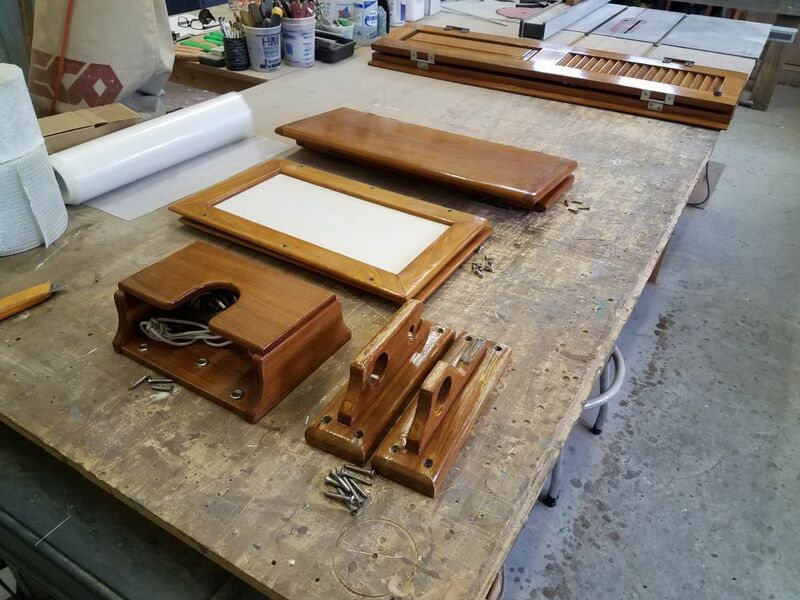 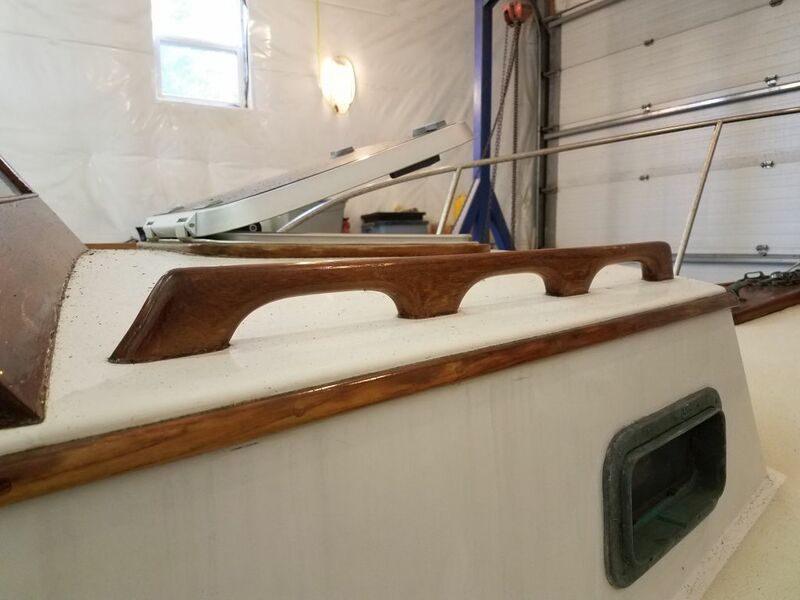 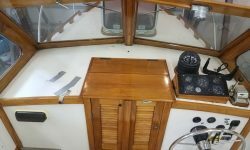 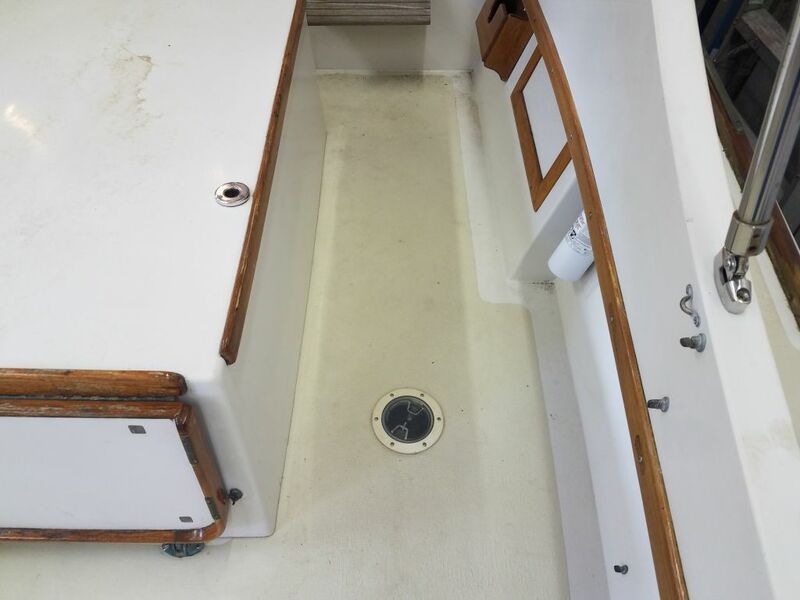 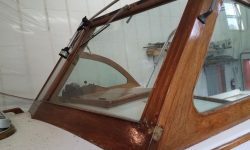 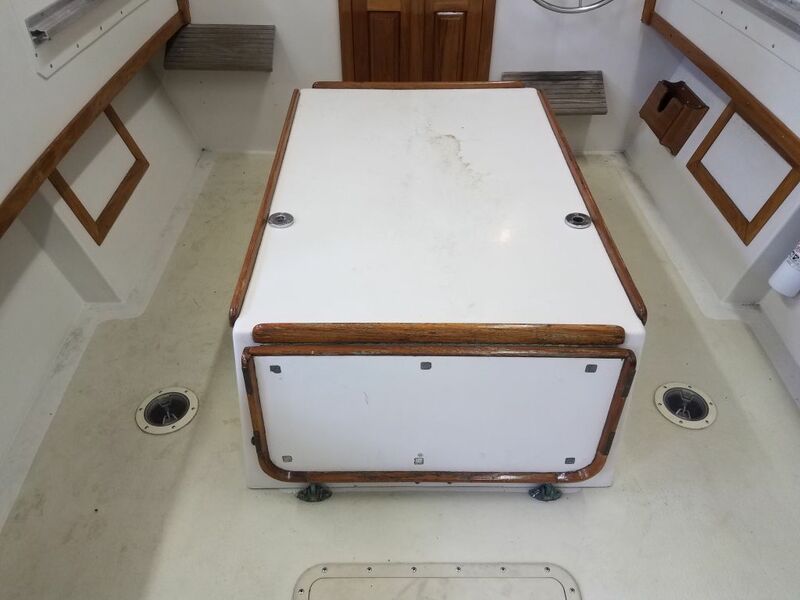 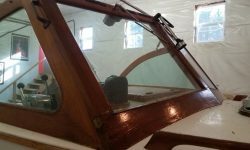 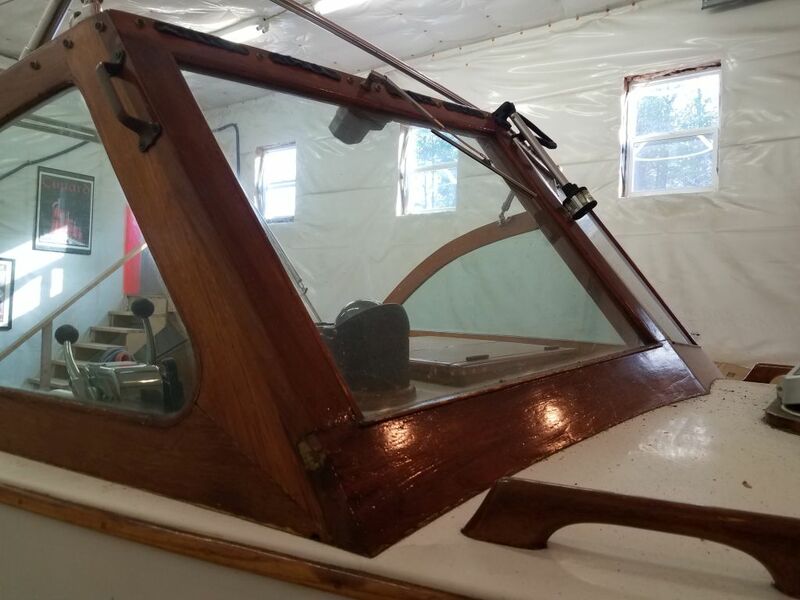 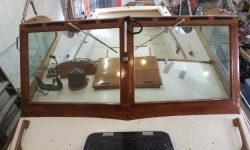 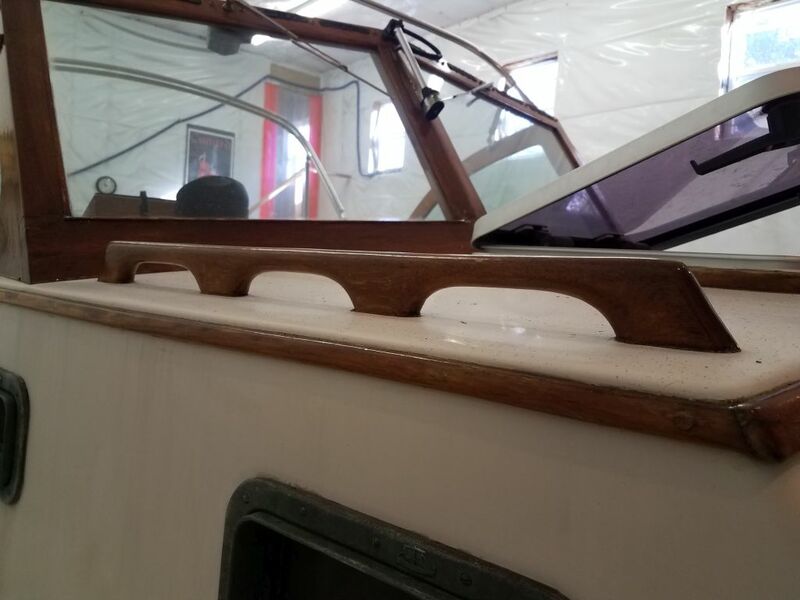 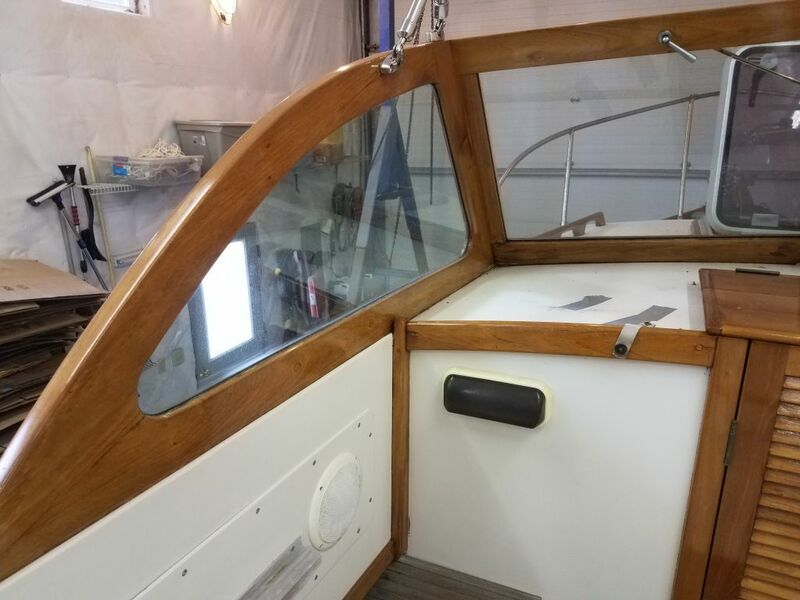 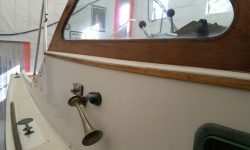 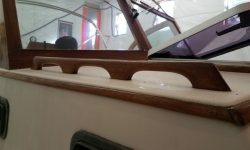 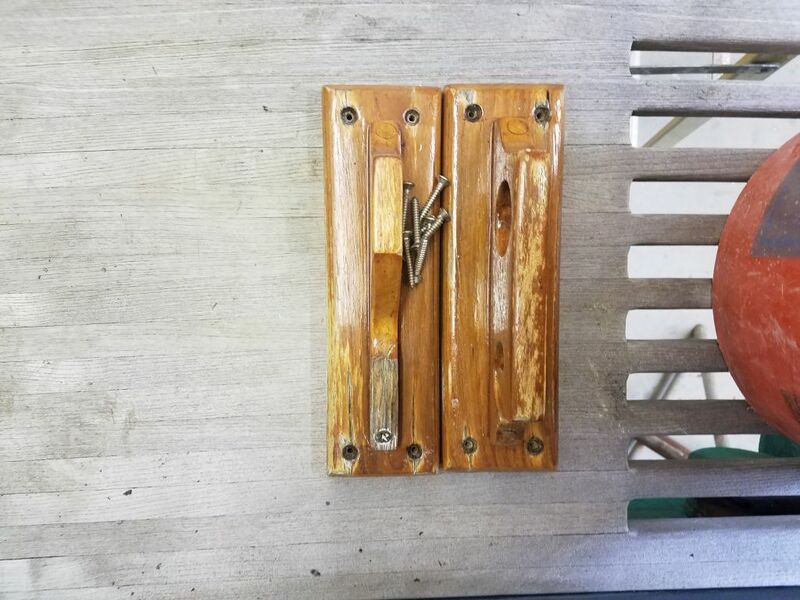 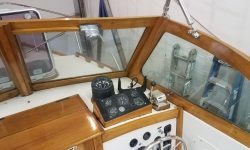 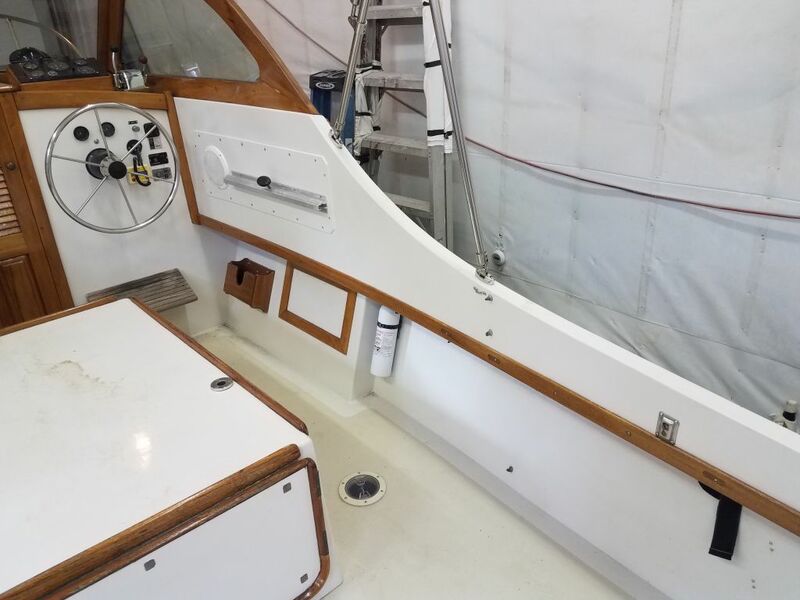 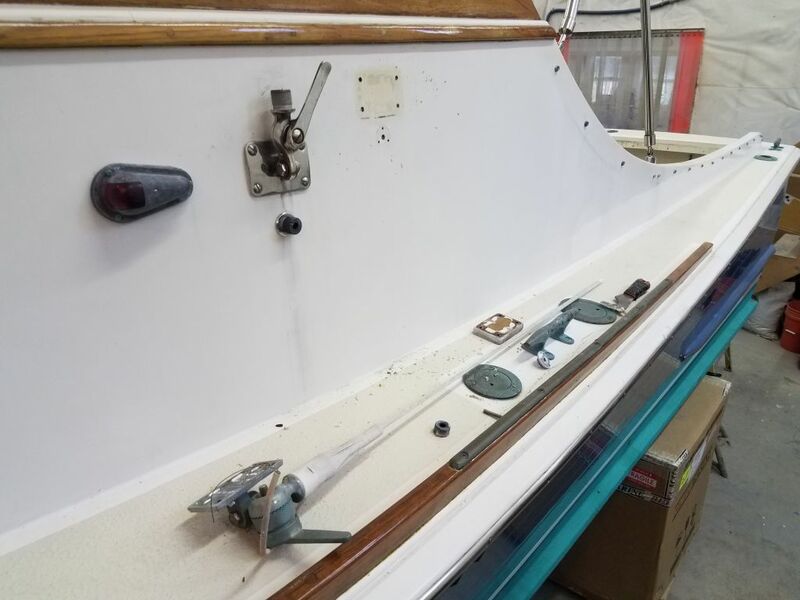 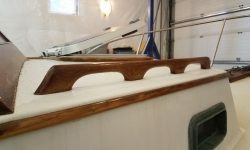 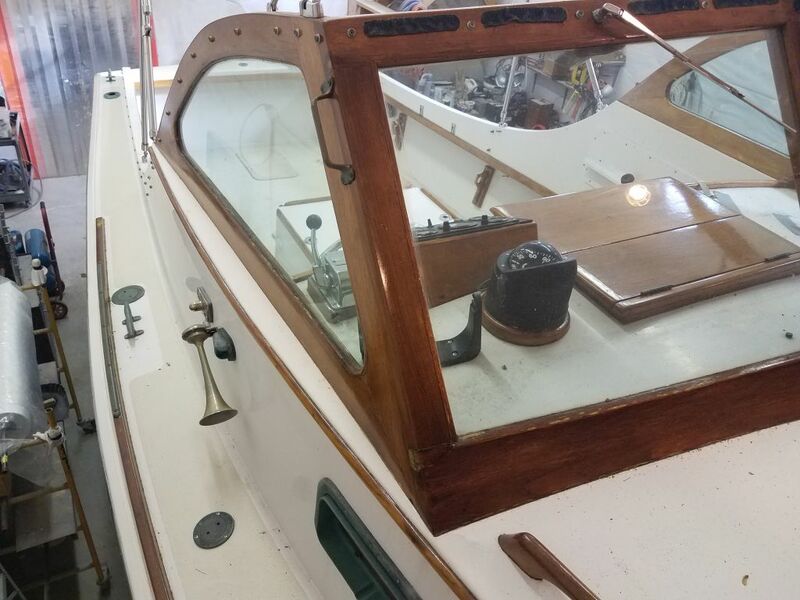 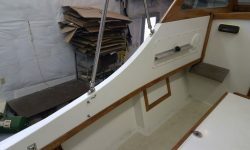 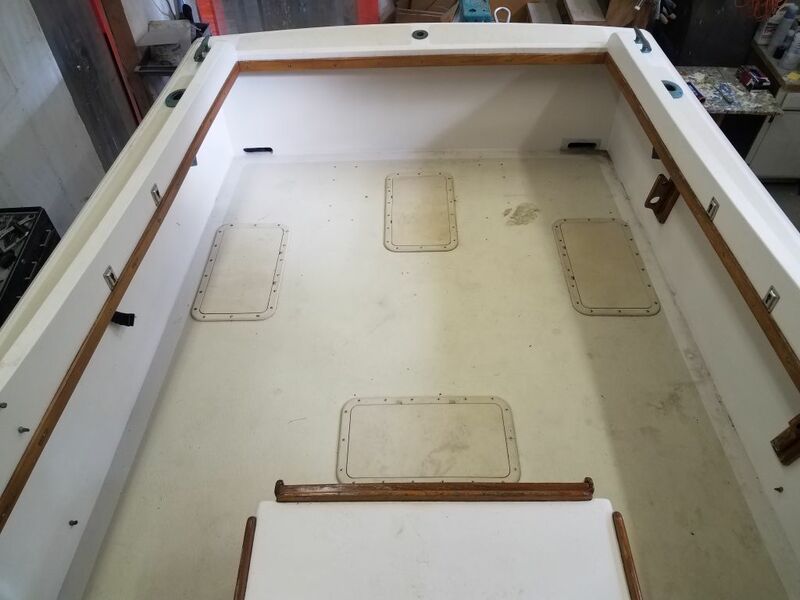 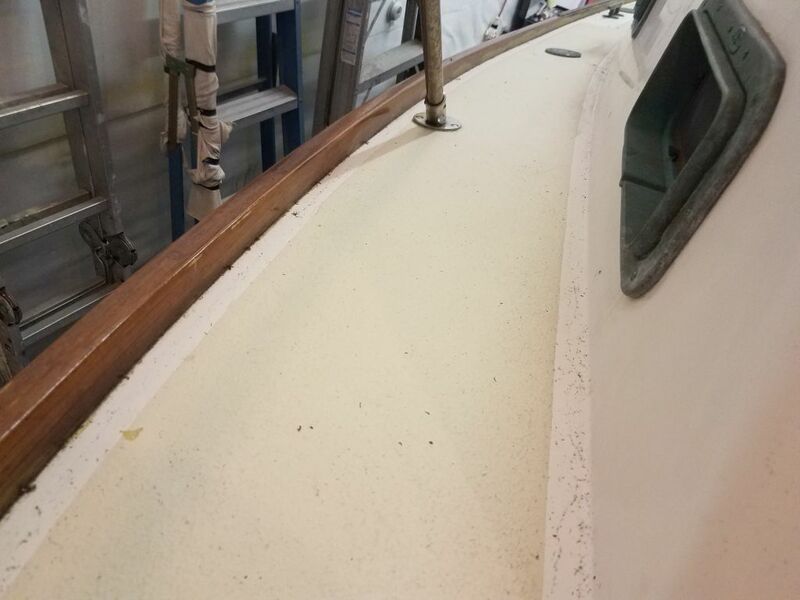 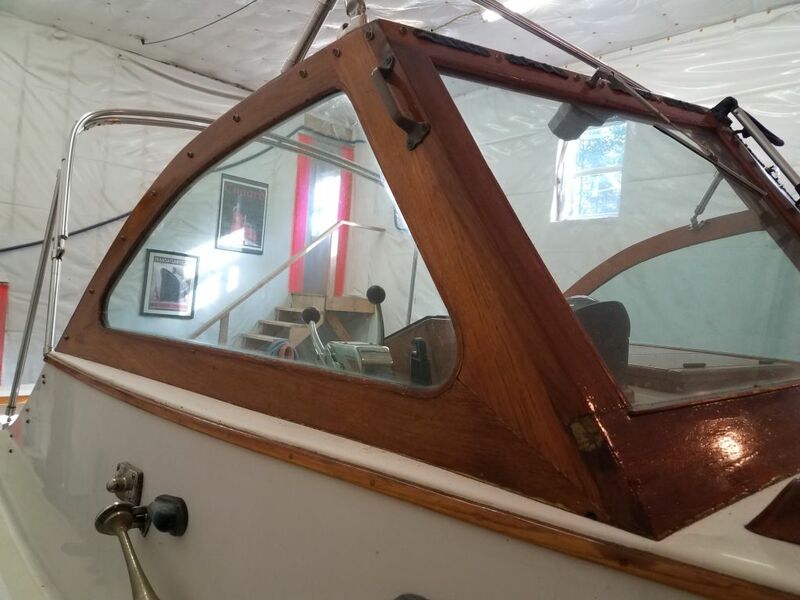 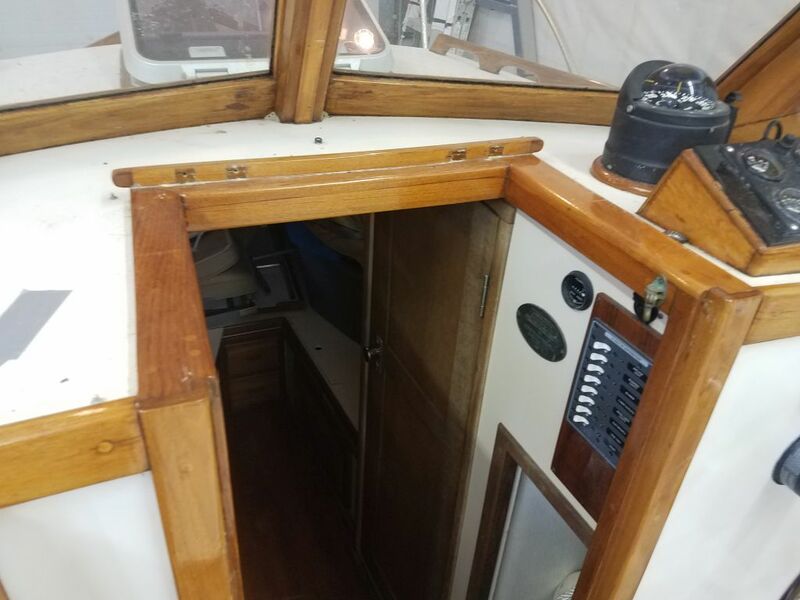 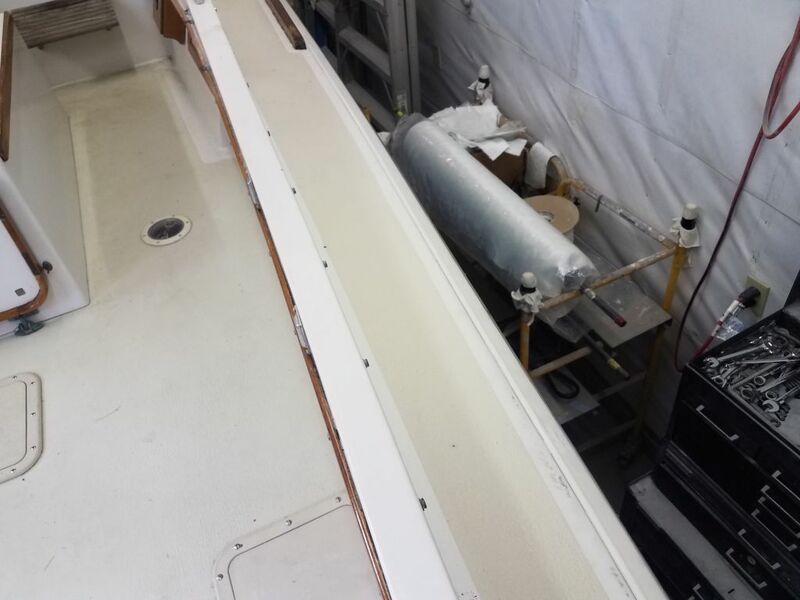 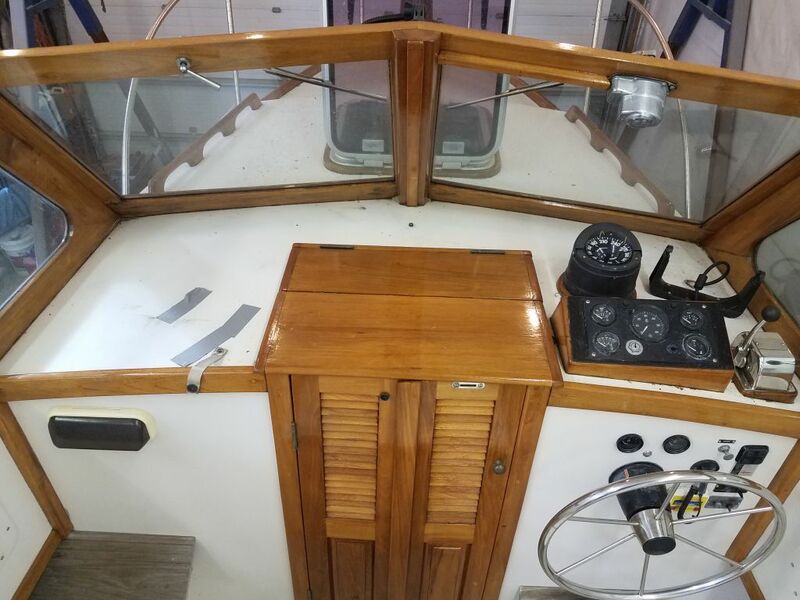 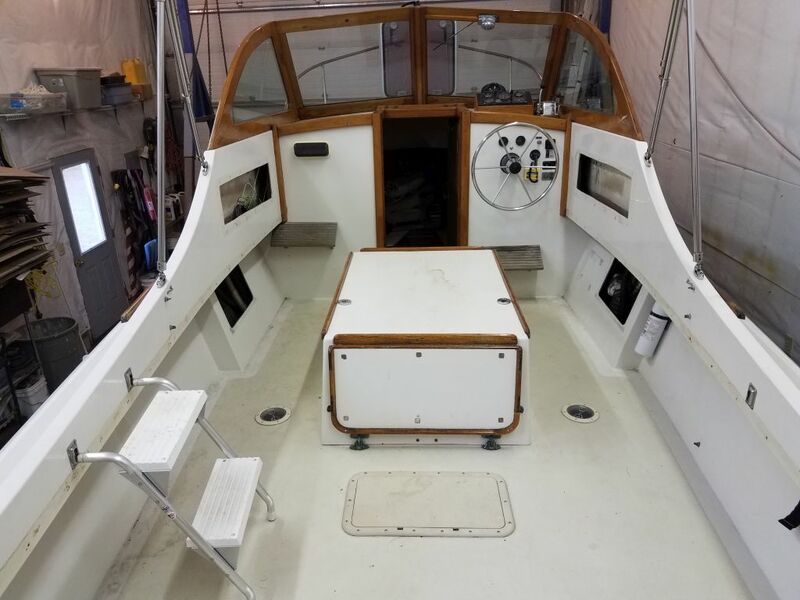 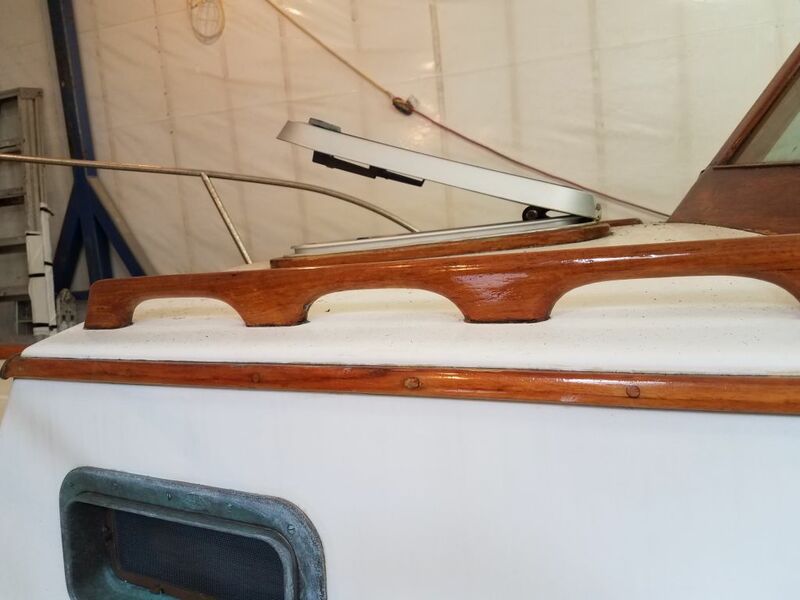 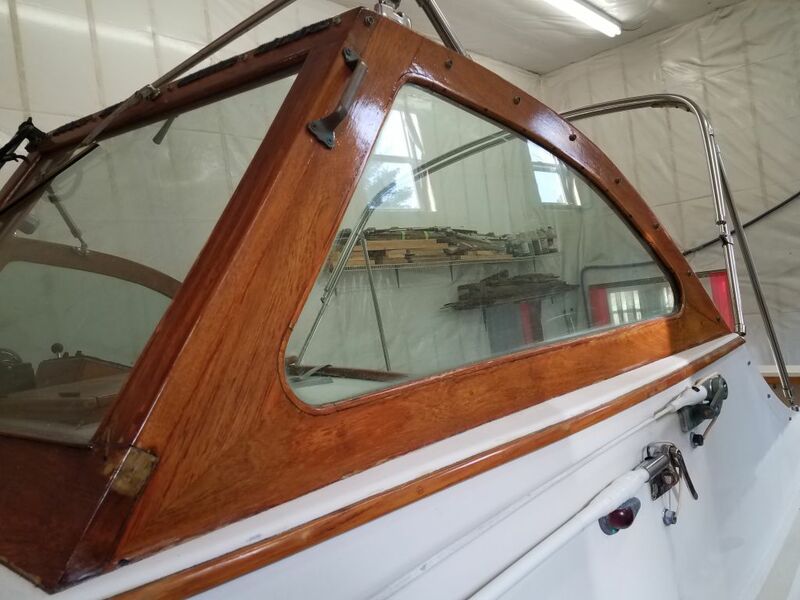 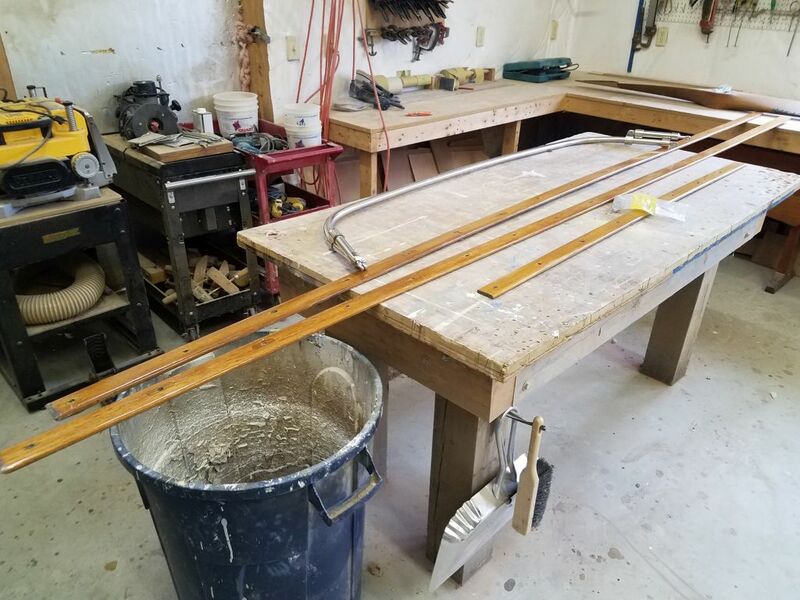 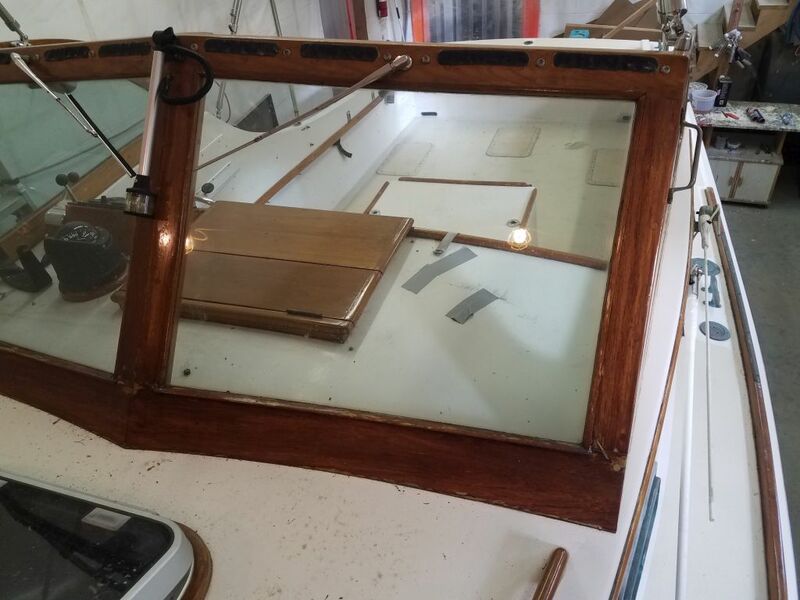 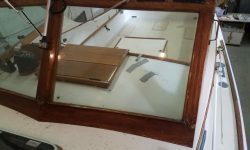 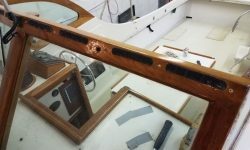 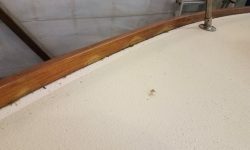 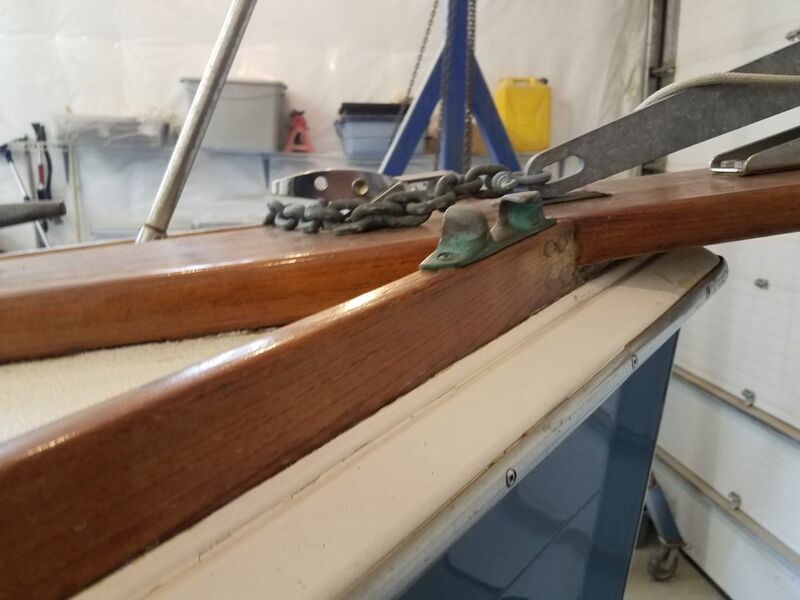 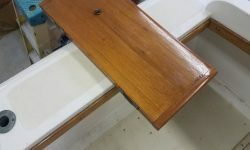 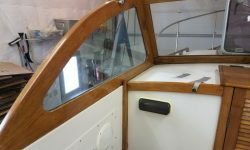 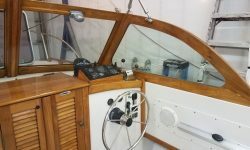 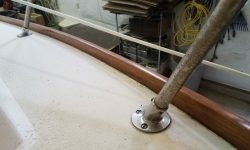 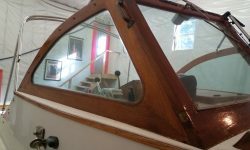 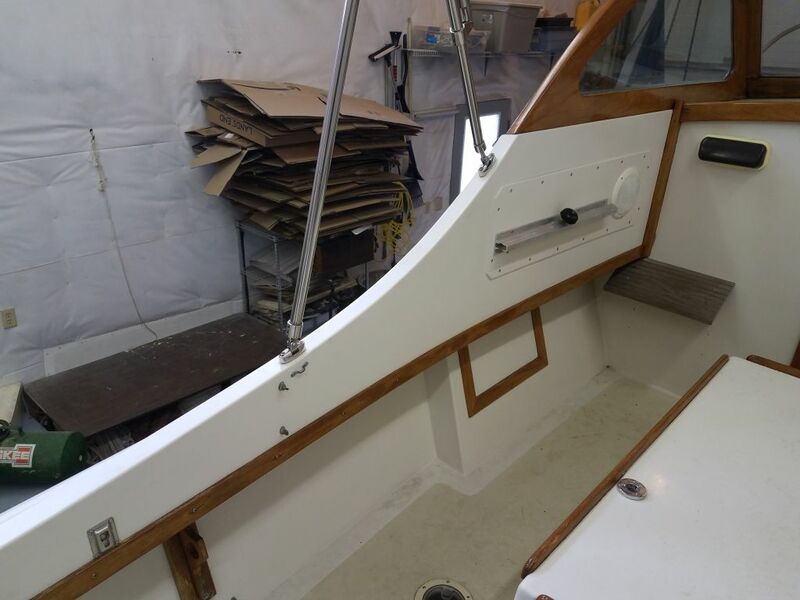 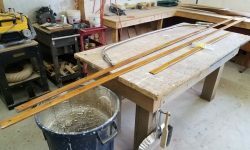 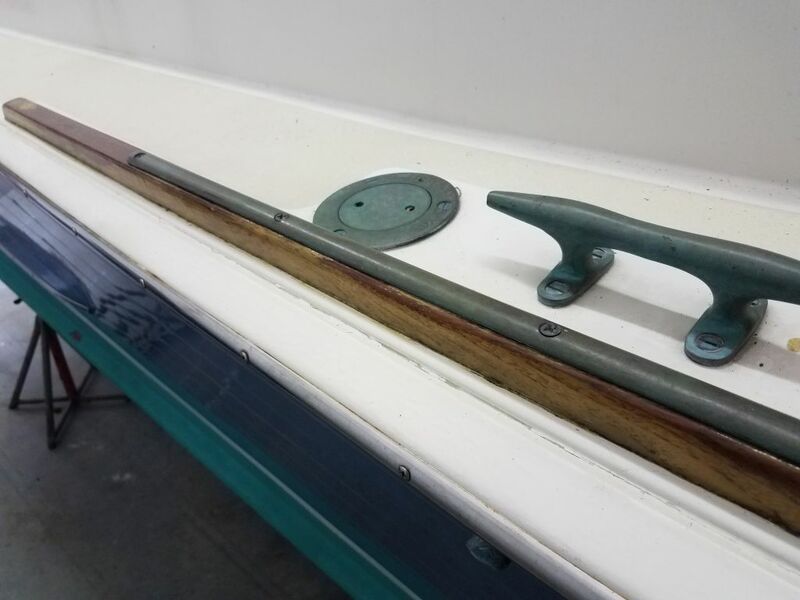 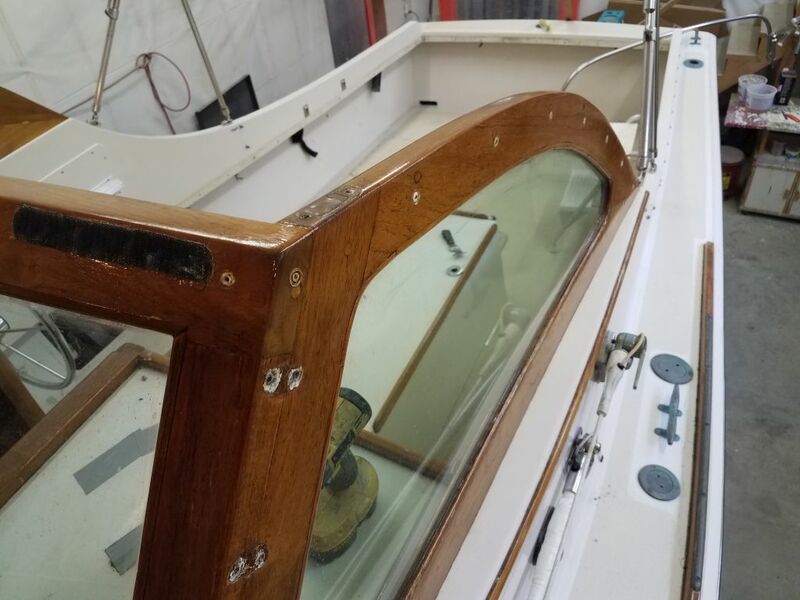 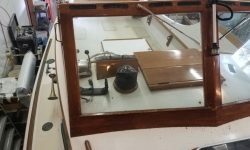 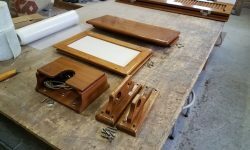 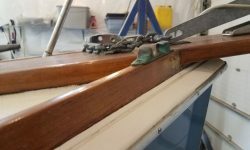 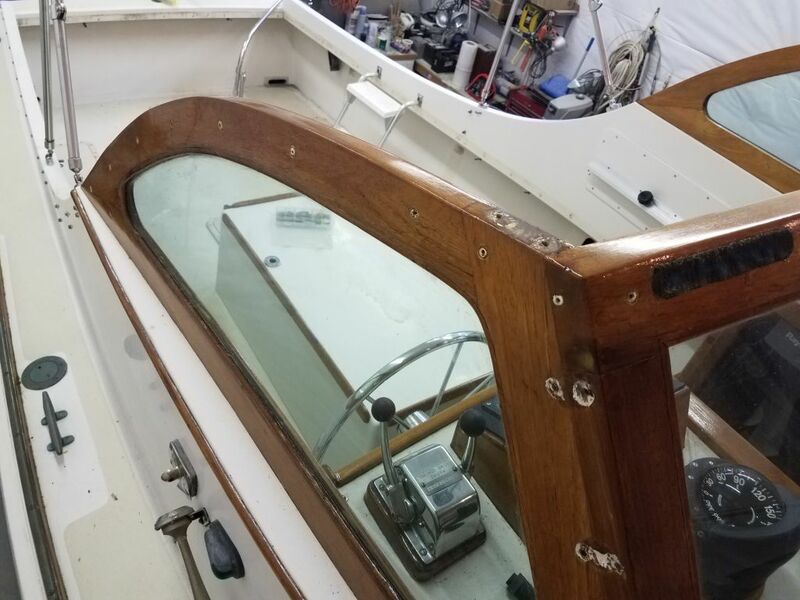 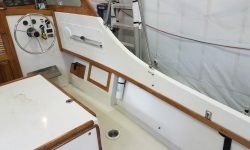 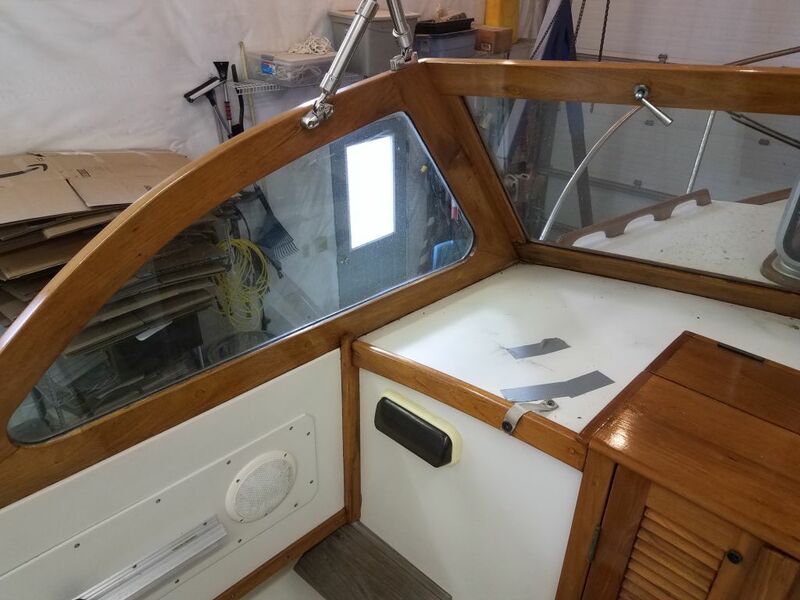 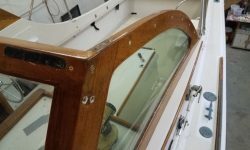 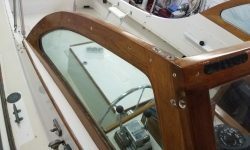 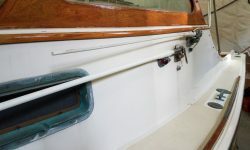 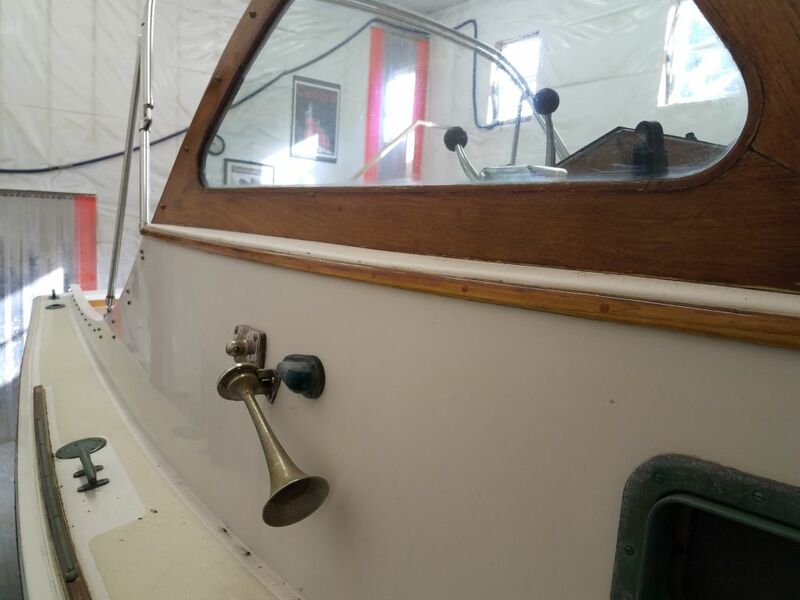 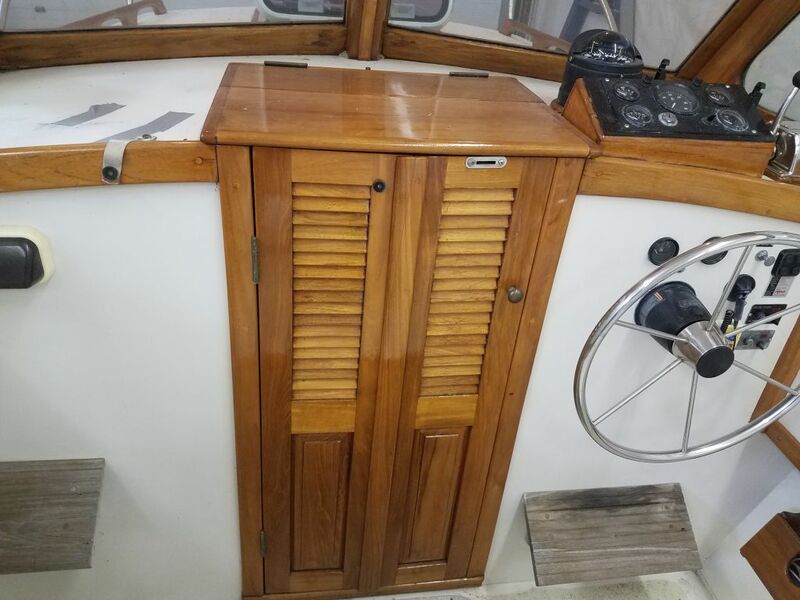 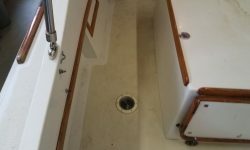 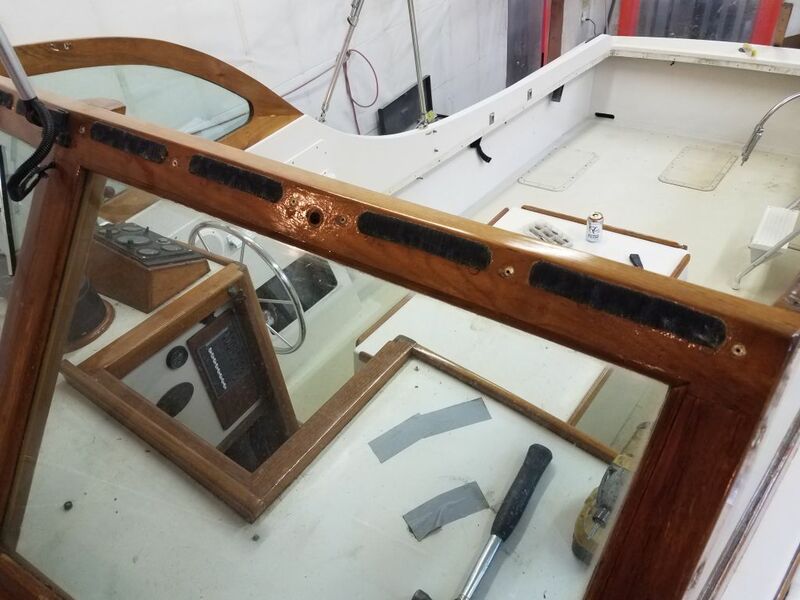 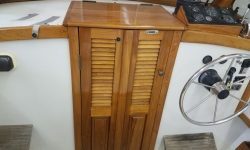 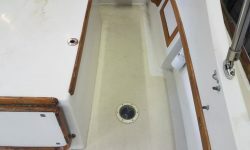 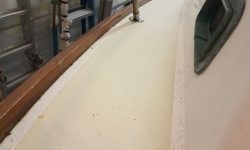 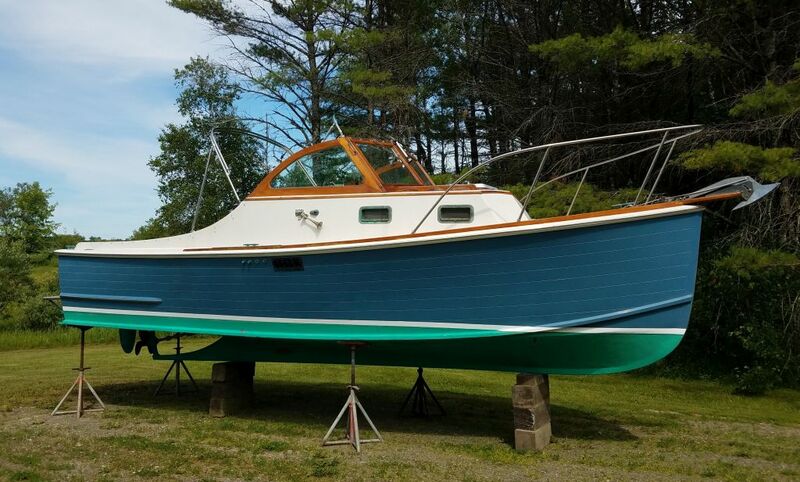 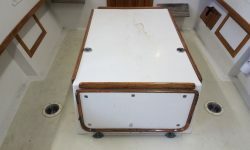 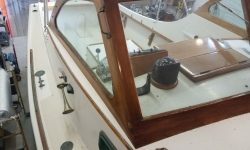 The fairly substantial brightwork on the boat, all varnished teak, was in essentially good condition, and many areas would require just normal maintenance sanding and fresh coats of varnish, or at least so it appeared at first inspection. 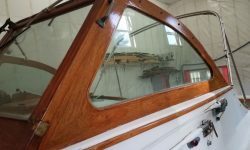 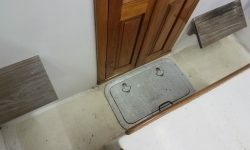 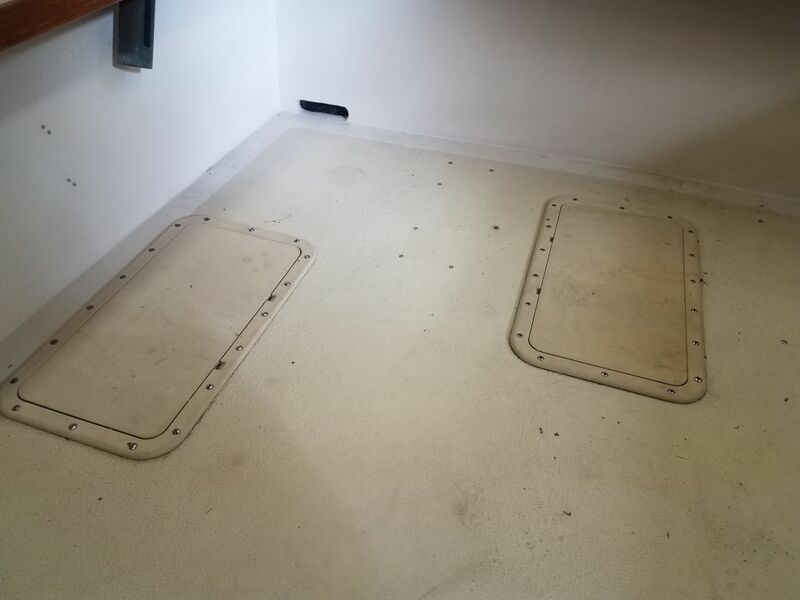 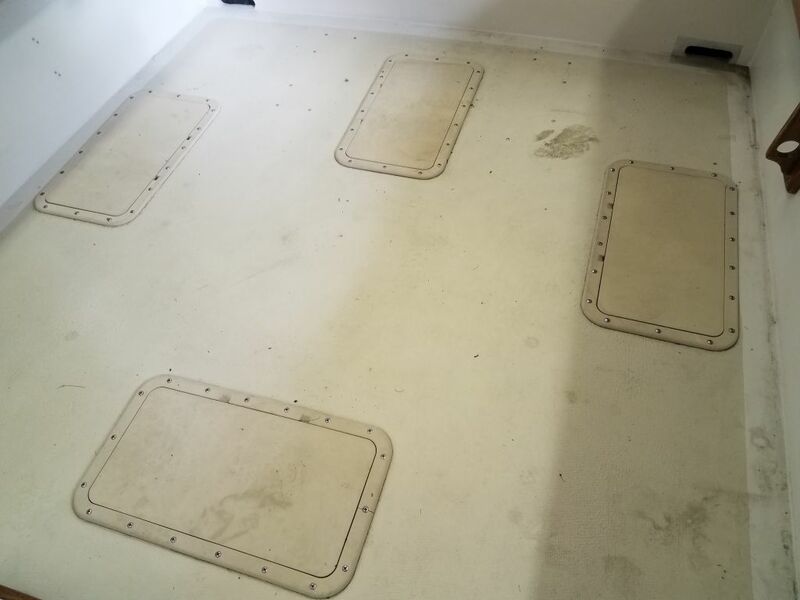 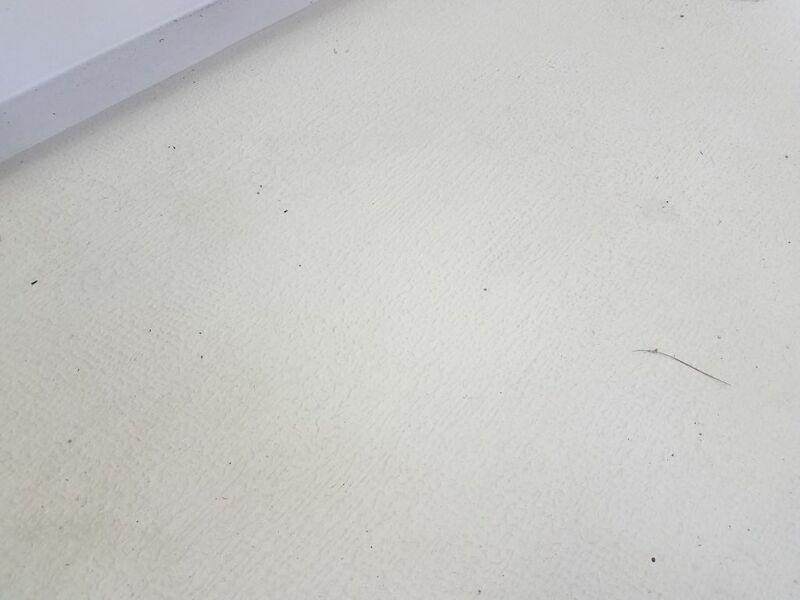 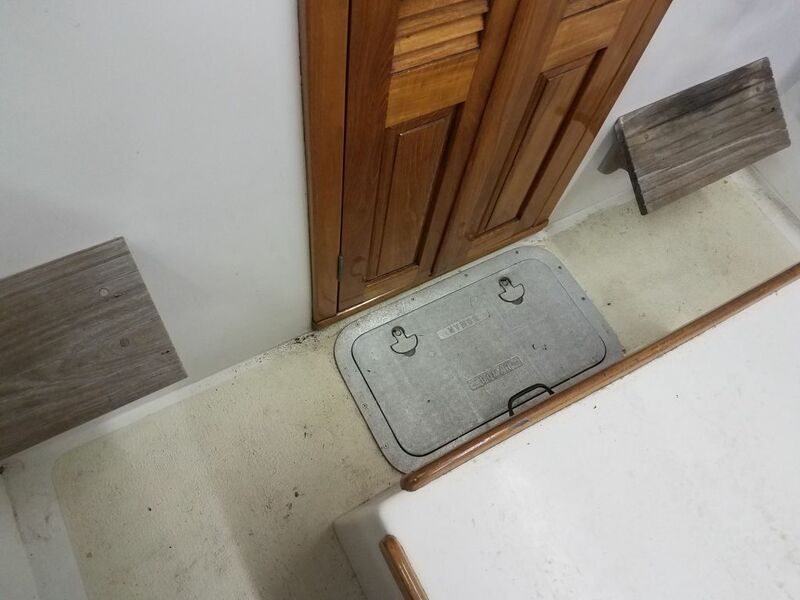 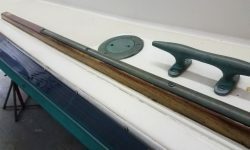 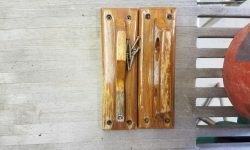 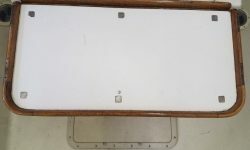 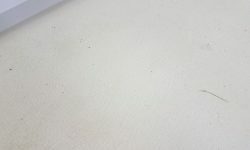 However, the forward hatch coaming and the toerails on both sides, in particular, would require stripping and complete refinishing, as the old coating had failed too substantially in these areas. 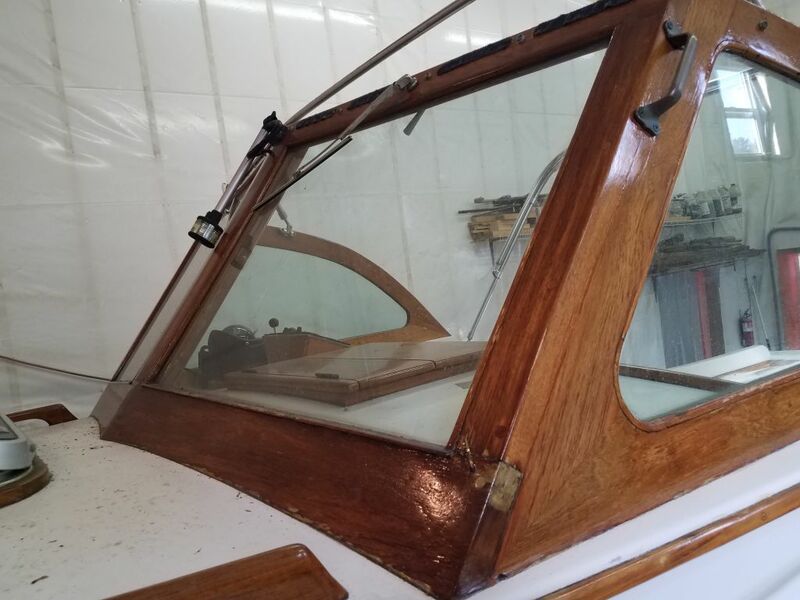 The massive windscreen was in good condition on the inside, where it was largely protected by the boat’s canvas top, and the exterior was in mainly good condition. 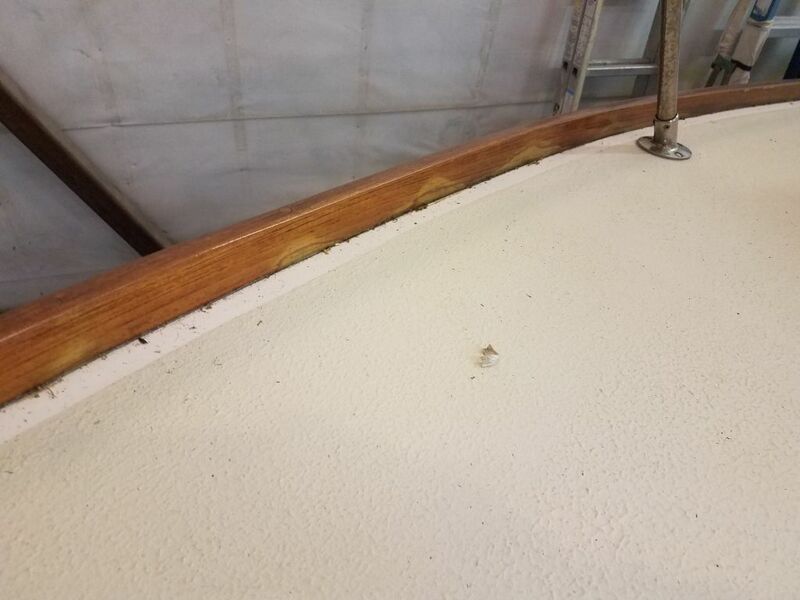 Several seams between the pieces, always trouble spots on this structure, showed signs of water infiltration, but for the moment I hoped that spot repairs and then several good coats over the top would take care of things. Time would tell. 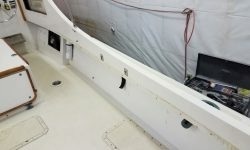 Handrails, eyebrow trim, and various trim pieces in the cockpit looked like they’d be OK with a few maintenance coats, but as I began the preparations I’d make adjustments as needed. 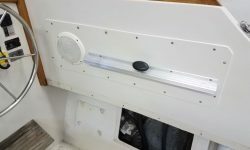 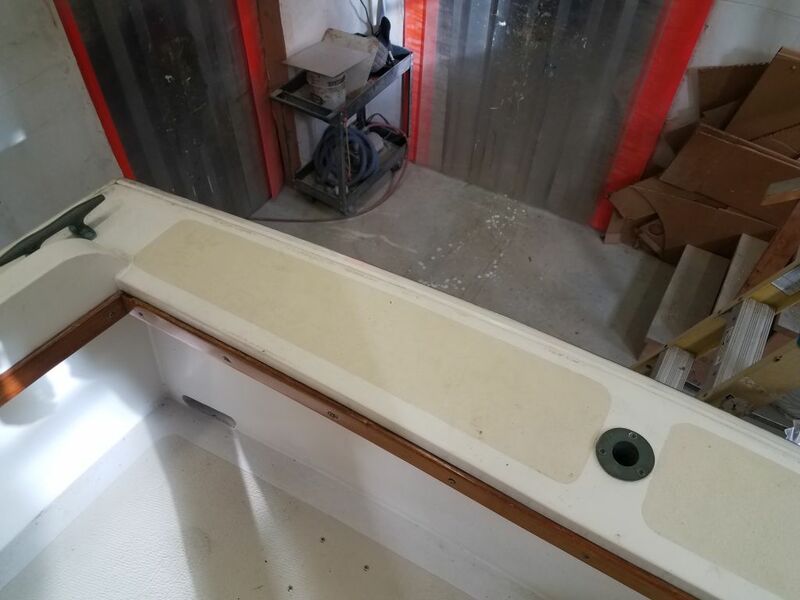 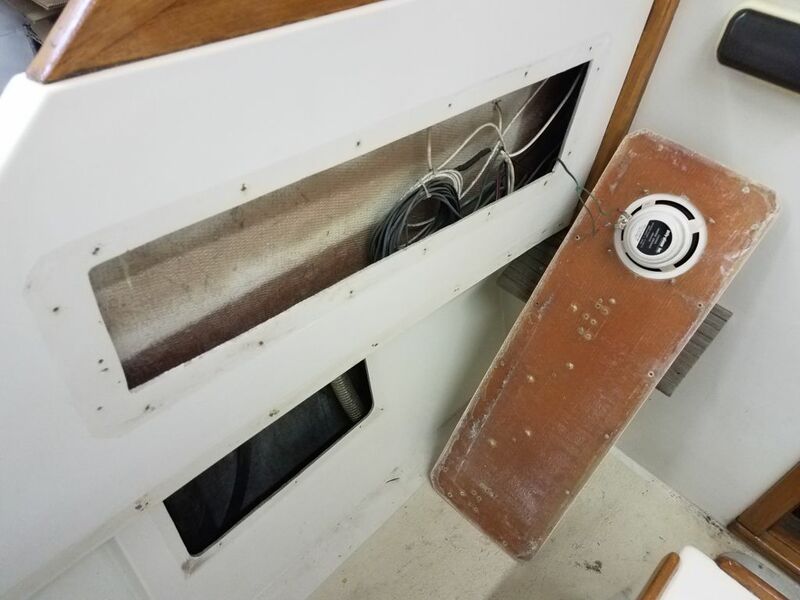 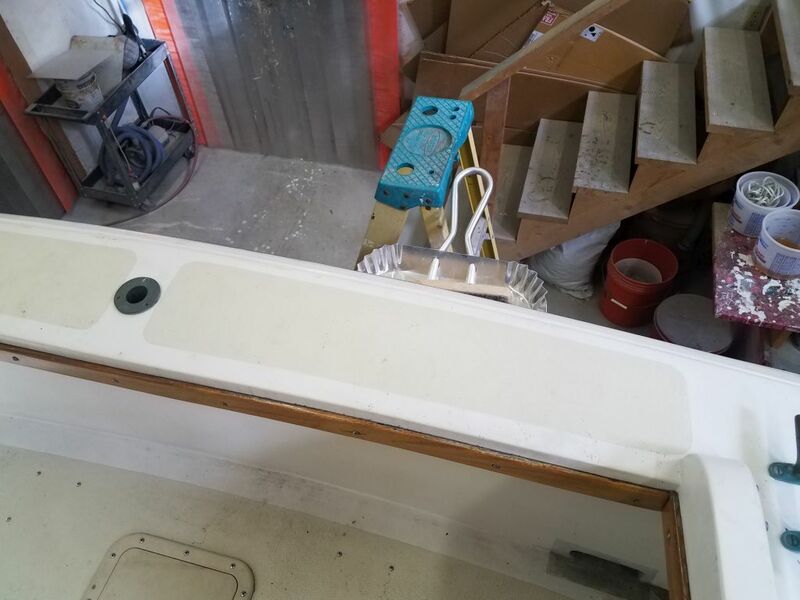 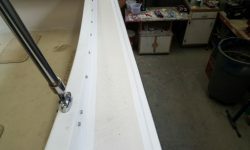 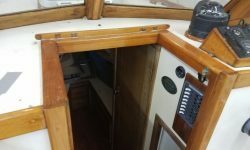 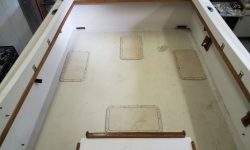 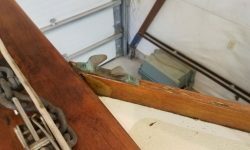 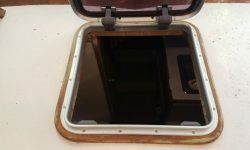 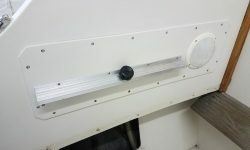 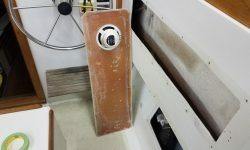 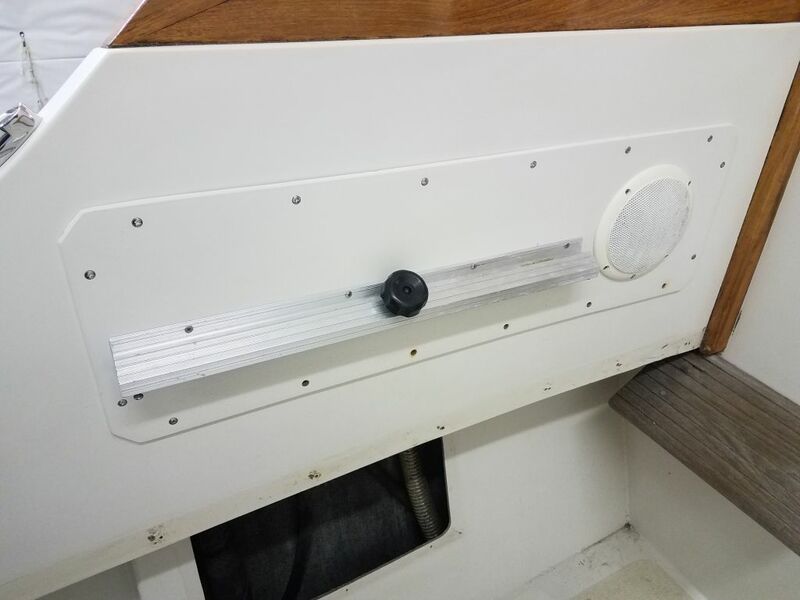 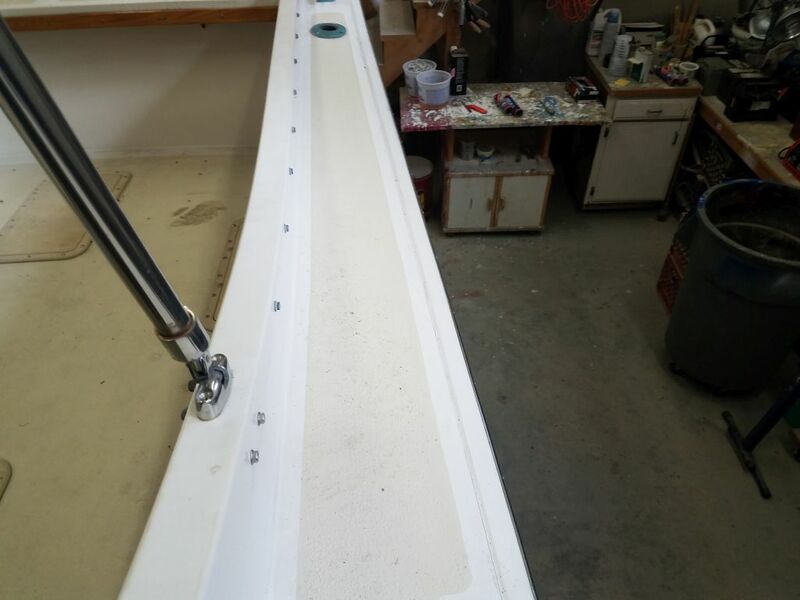 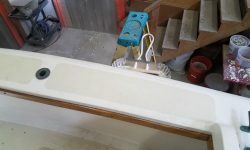 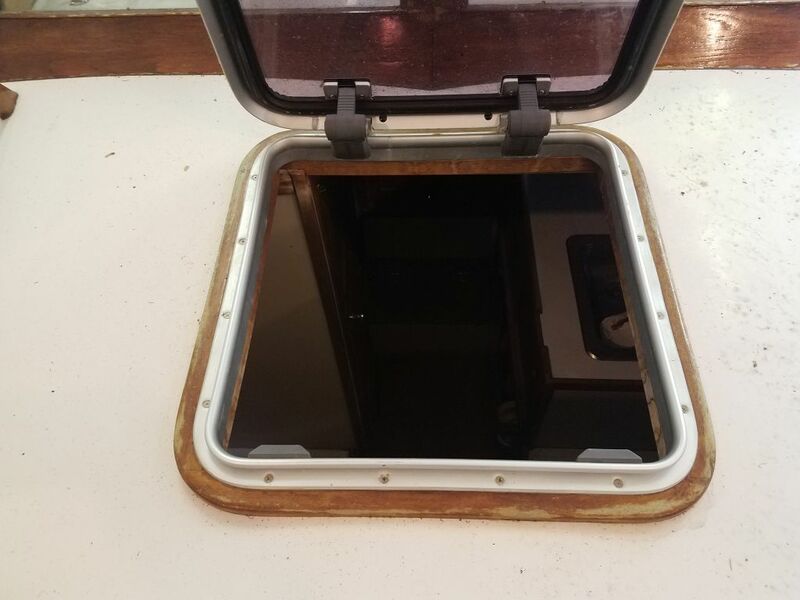 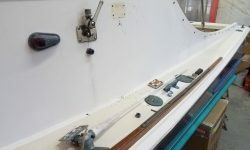 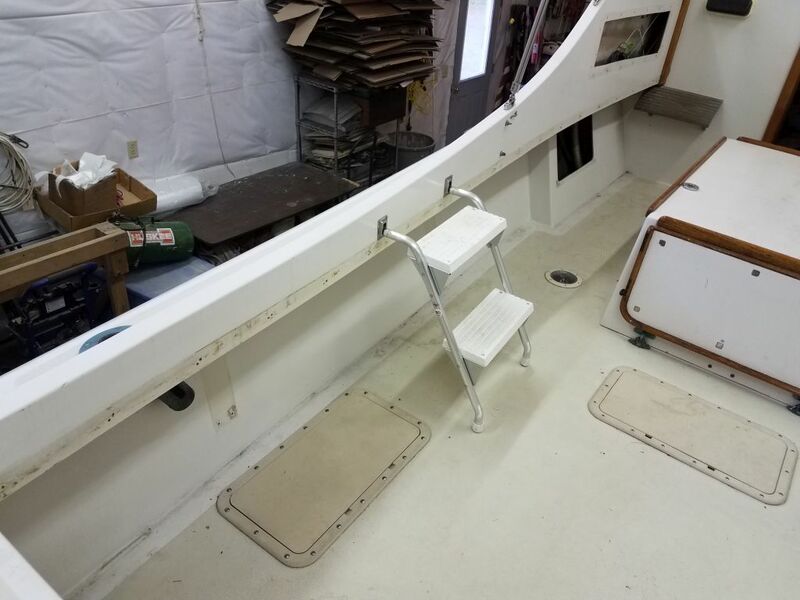 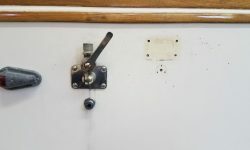 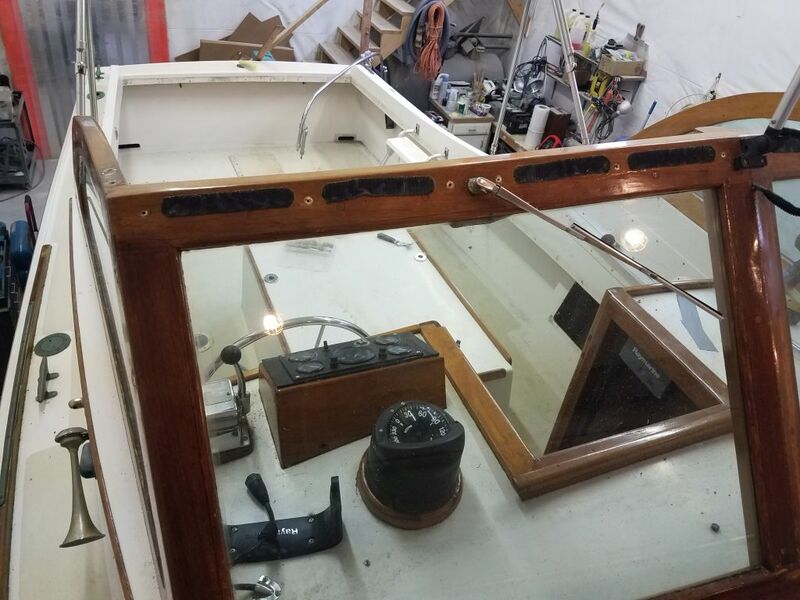 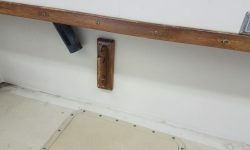 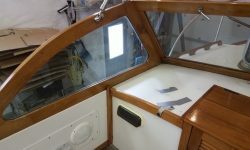 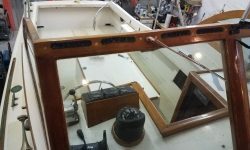 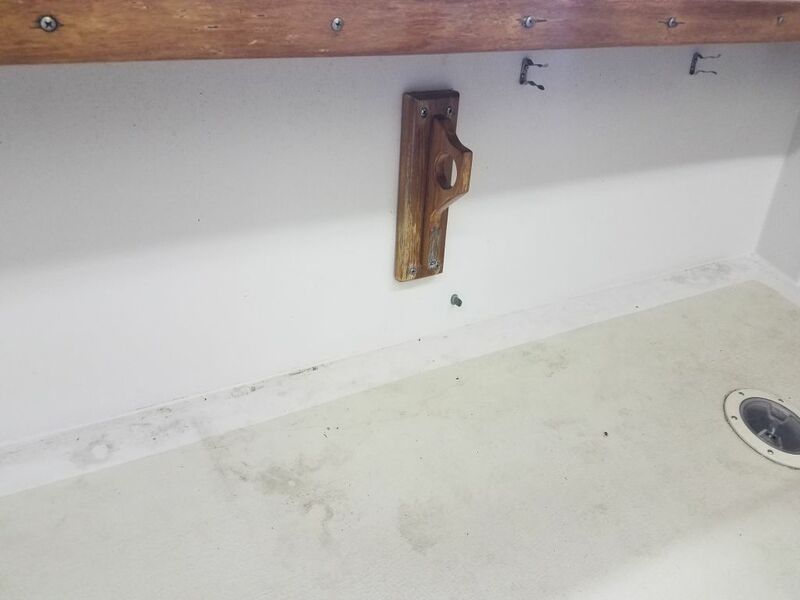 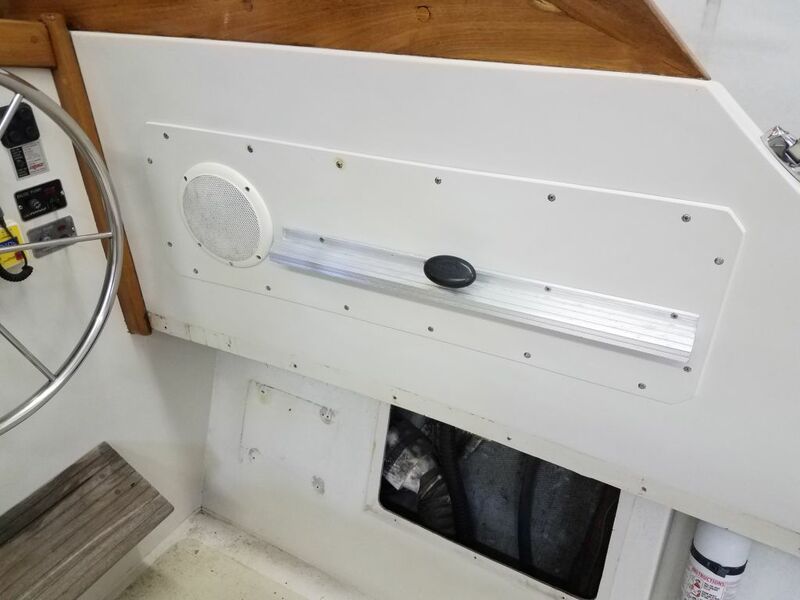 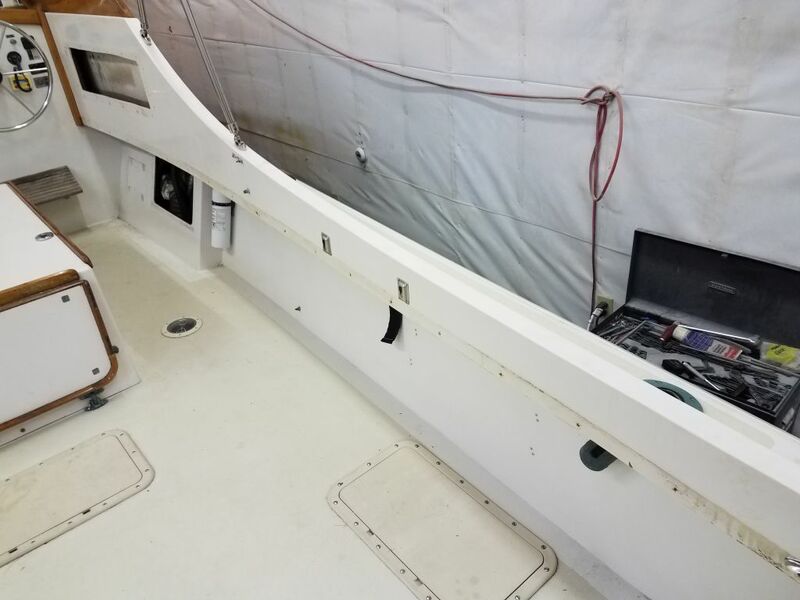 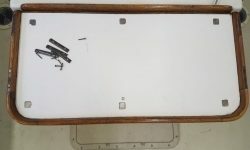 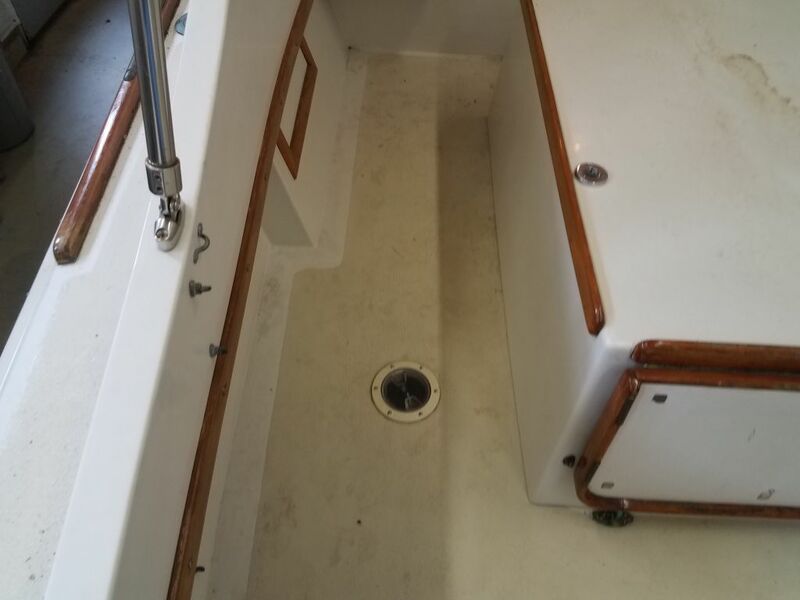 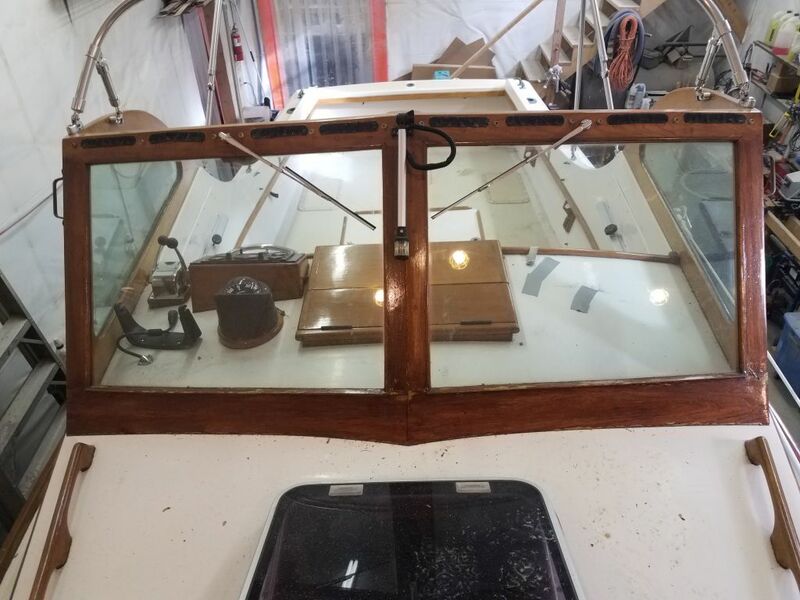 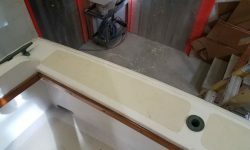 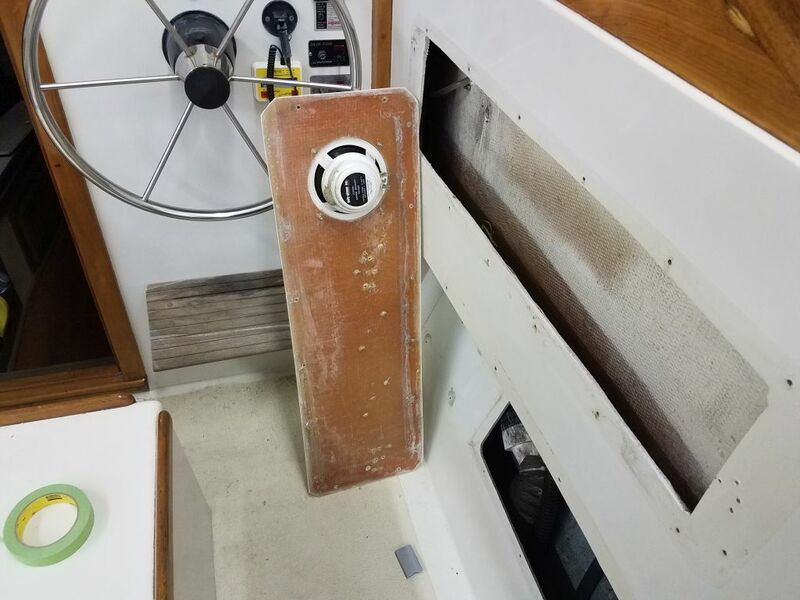 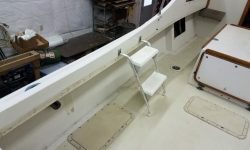 I worked my way around the boat, removing hardware that would be in the way for work on the varnish, such as canvas snaps, small fittings, and so forth, and also removed any trim pieces that I could to make the work easier: the companionway hatch and door and cockpit trim, including several small pieces located beneath the coamings. 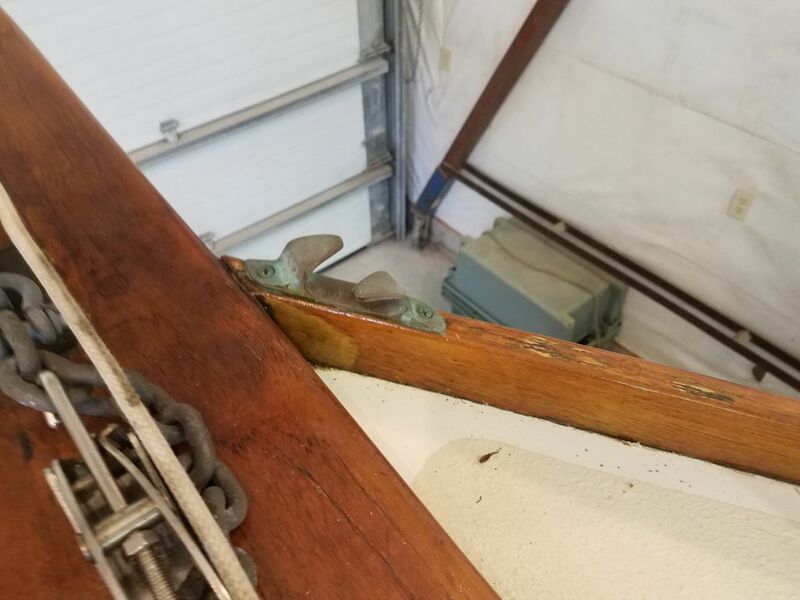 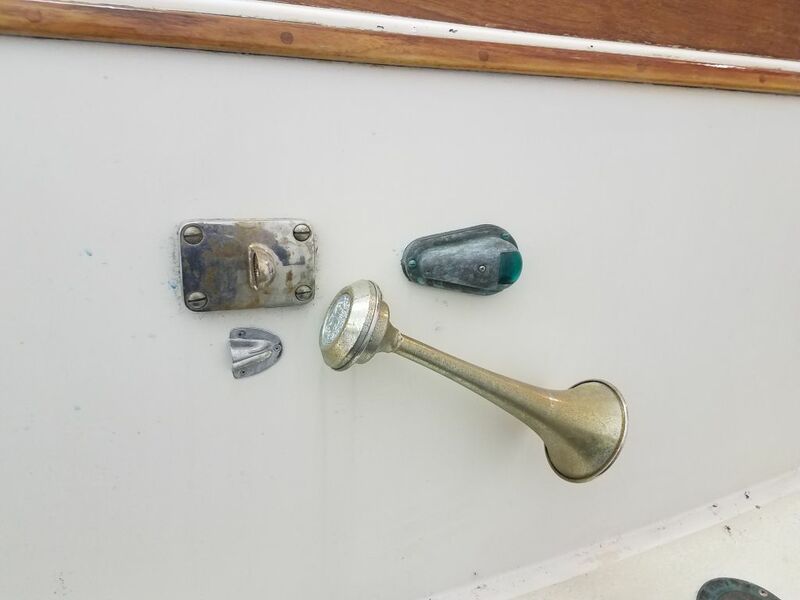 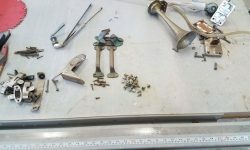 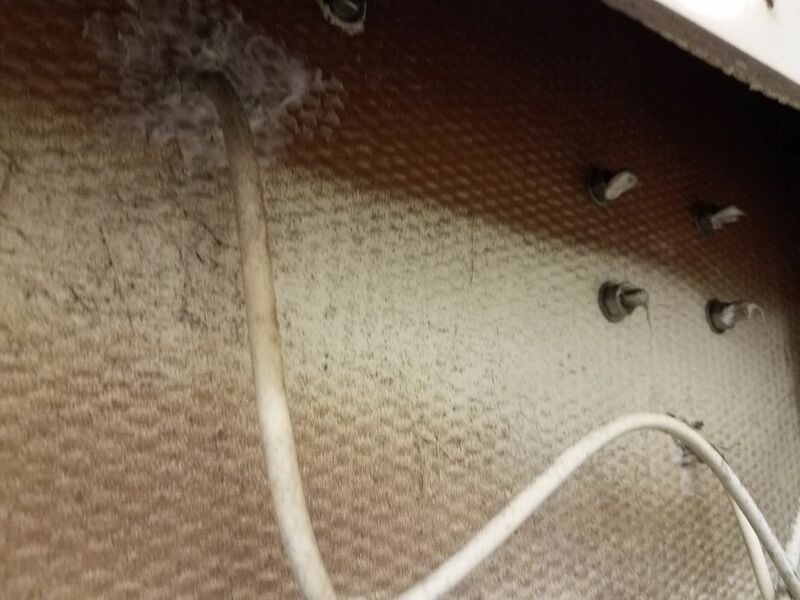 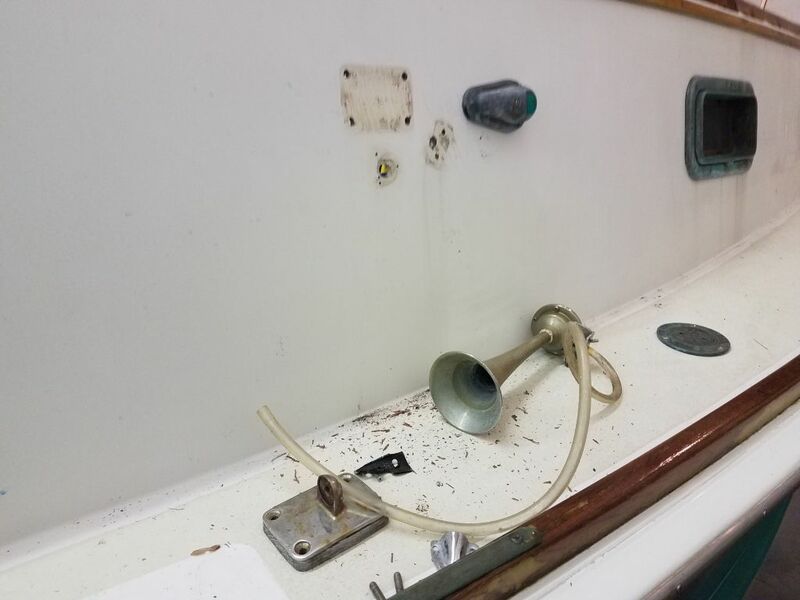 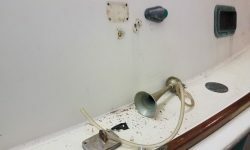 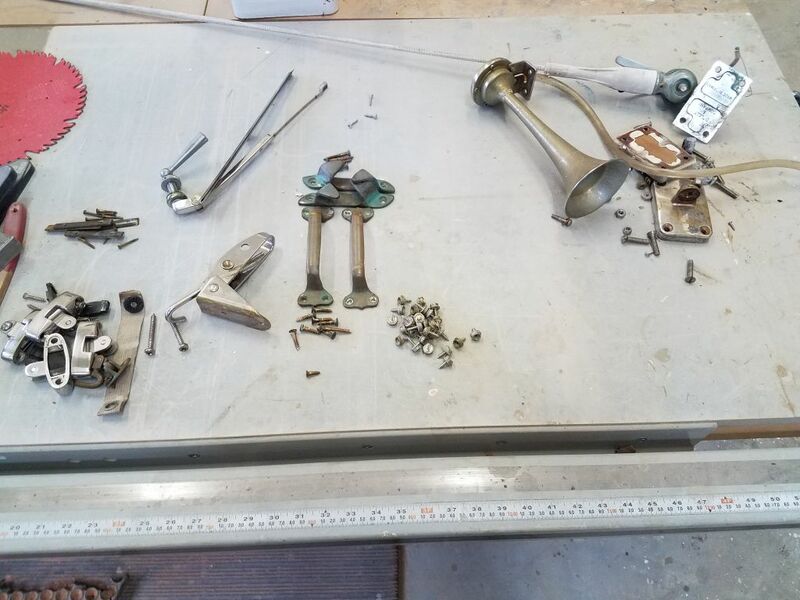 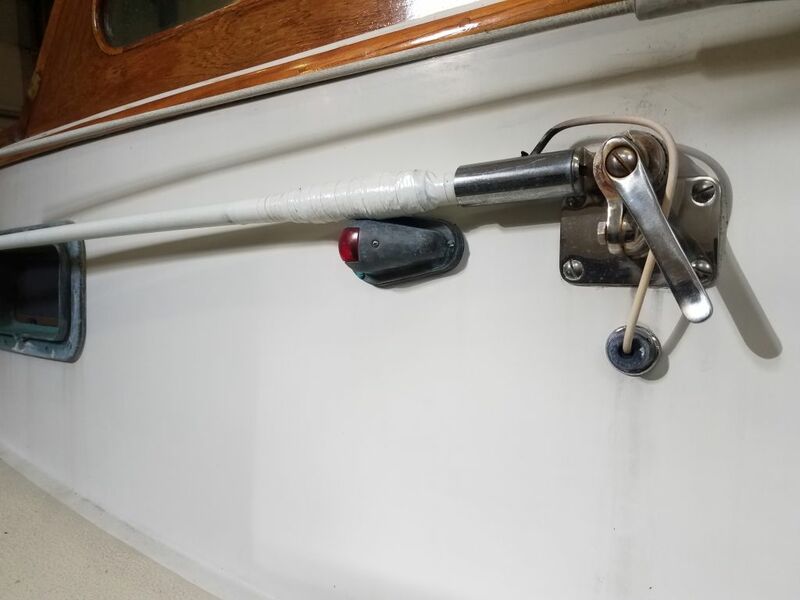 The owner requested that I remove, and repair the leftover holes from, several erroneous antenna fixtures on the sides of the cabin, along with an old horn. 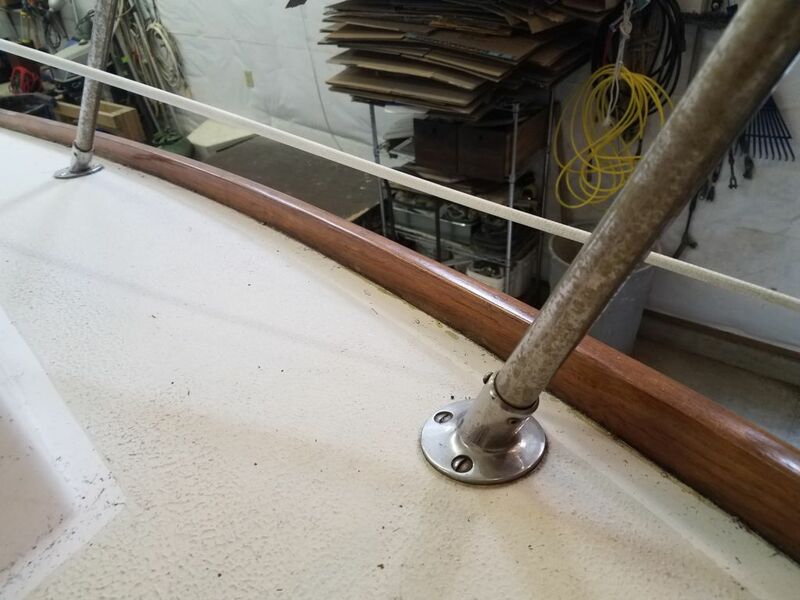 The one antenna that was to remain, an 8′ fiberglass VHF antenna, was broken and had been repaired with tape, and he requested that I replace this as well. 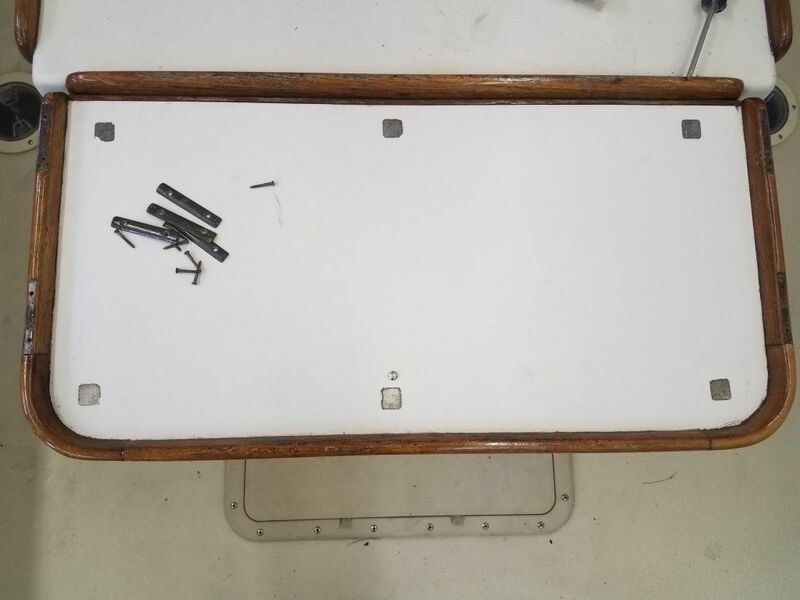 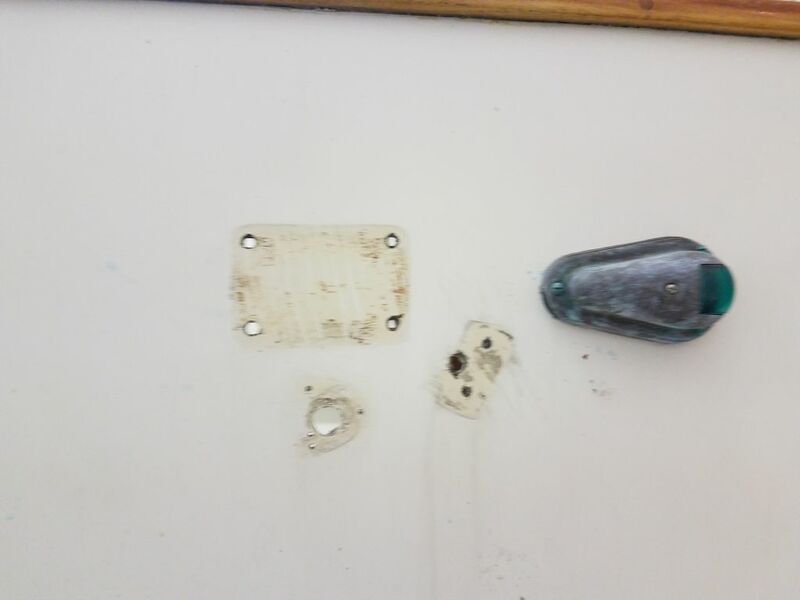 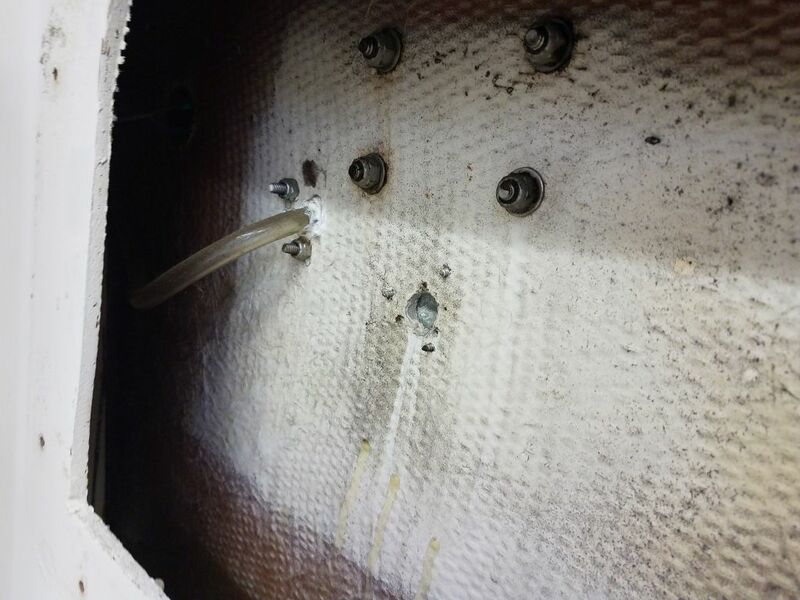 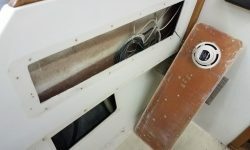 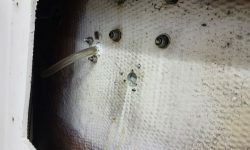 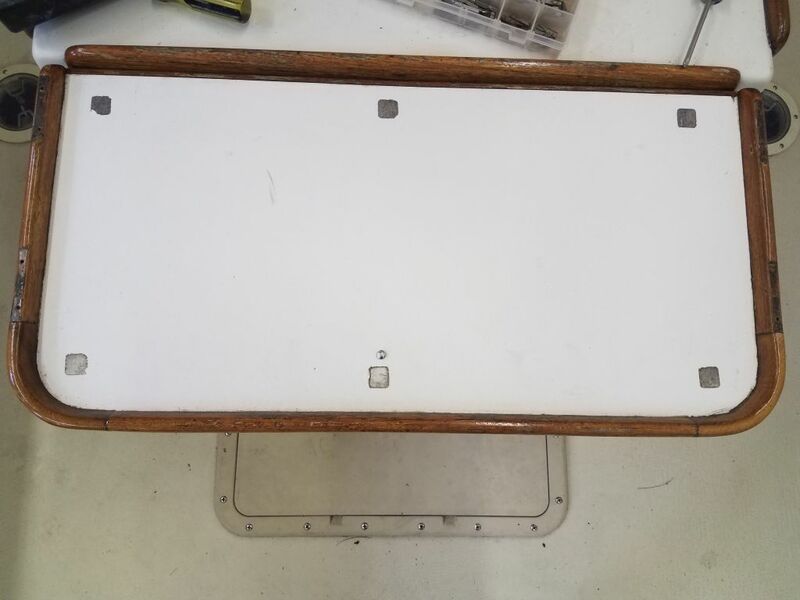 To gain access to the back side of this hardware, and the nuts securing it, I had to remove two large fiberglass panels, one on each side of the cockpit. 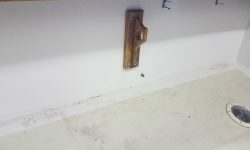 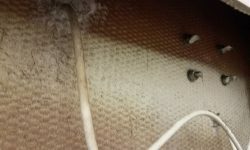 From there, removal was straightforward. 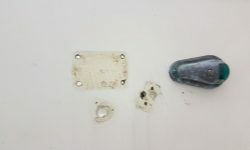 I left the ratchet antenna base for the VHF in place, and simply removed the old antenna from its threaded mount for replacement.